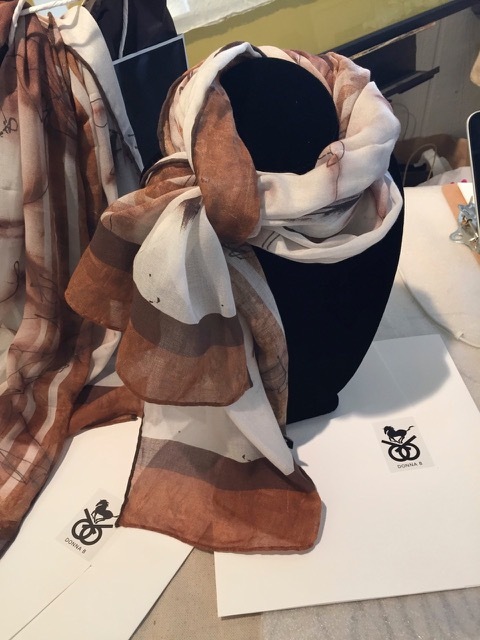 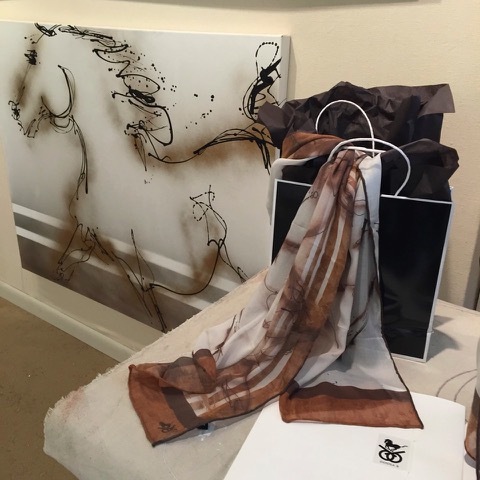 Designed from my painting “Two Horses”, this 14x60” soft modal scarf is a winner! 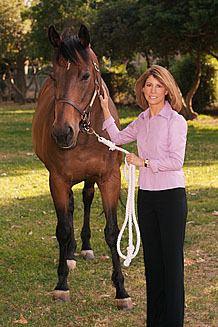 You can wrap in any style, and the neutral colors work as well in the barn and over your black satin jacket at night. 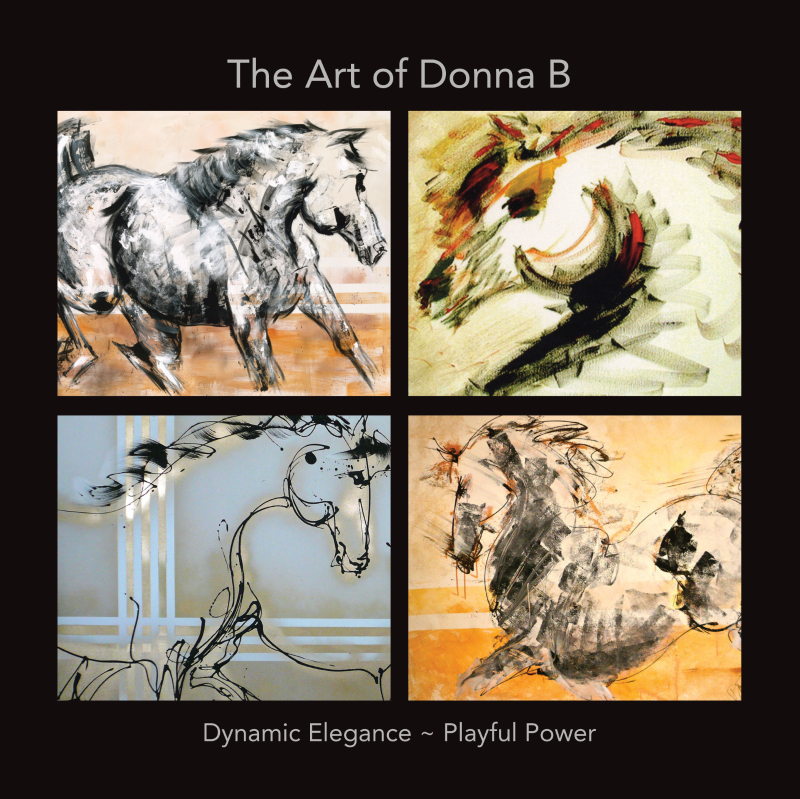 Donna B Fashion has arrived! 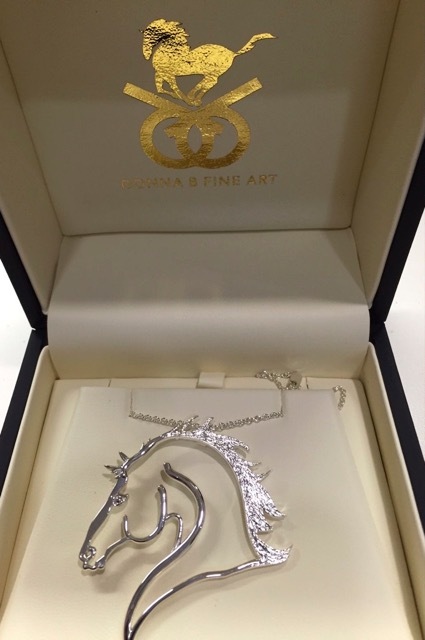 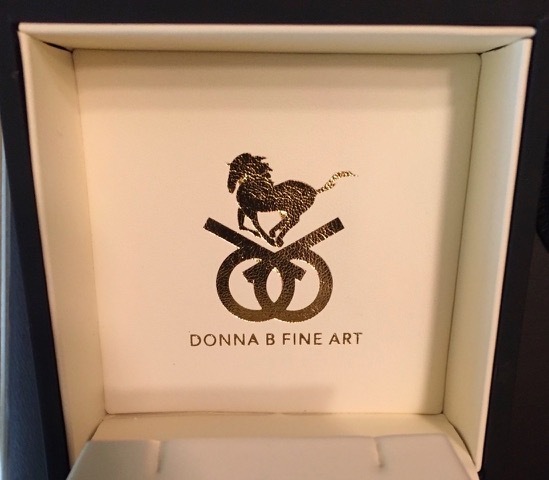 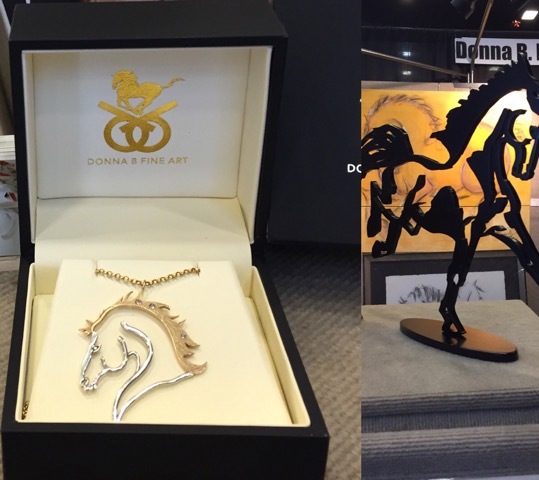 In the form of Wearable Art & Fine Jewelry - all available for purchase online at The Donna B Collection! 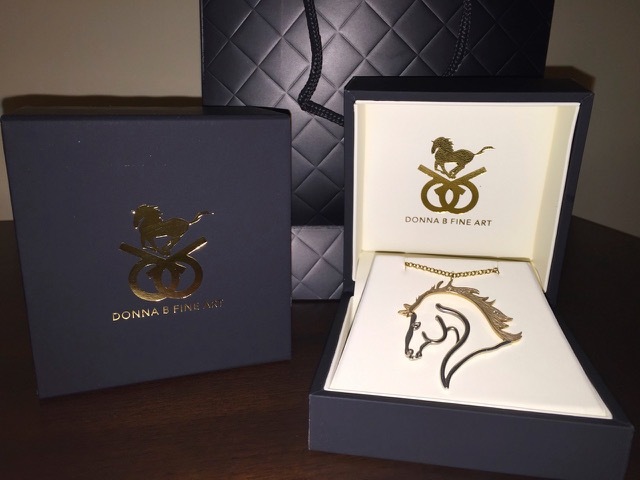 New Designs Coming Soon - visit donnabcollection.com often! 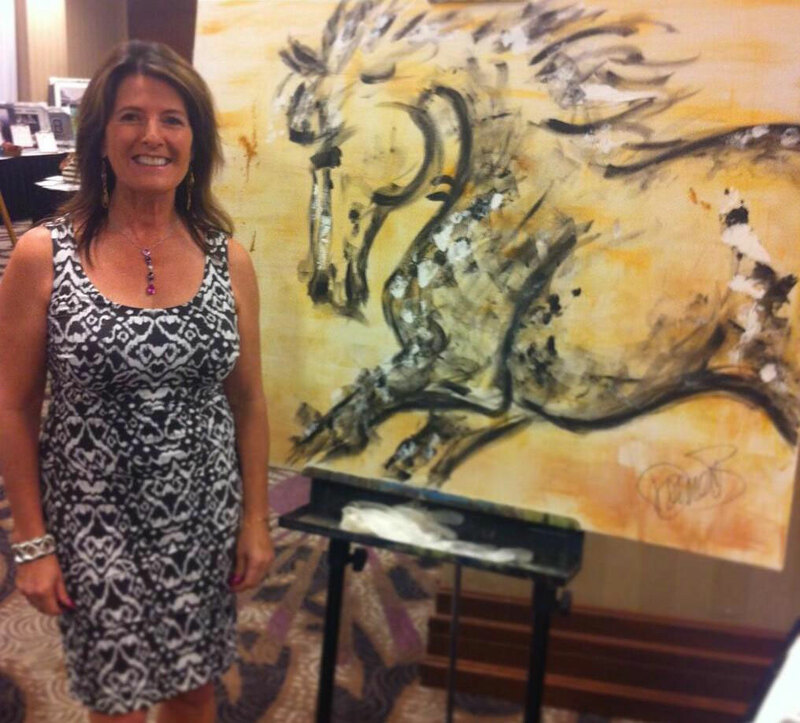 My profession and passion is painting the classic form of the horse with bold, unexpected colors in a signature style. 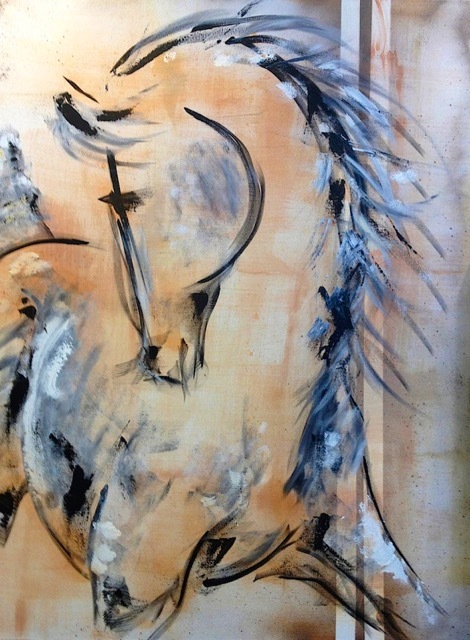 In contemporary mixed media art, I say, "It is not horses that I paint; I paint the way they make me feel." 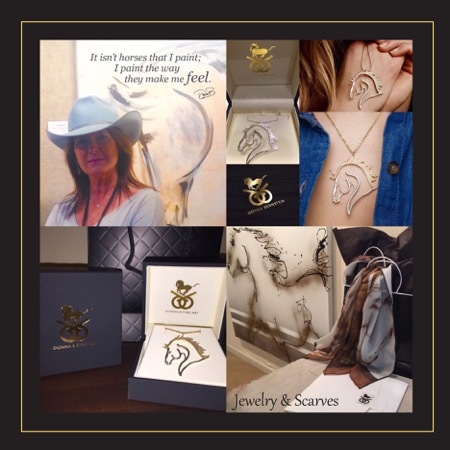 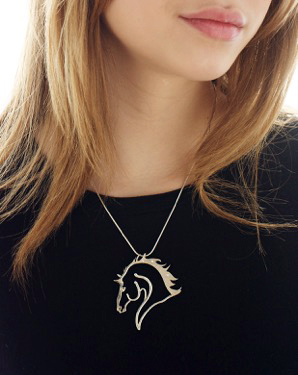 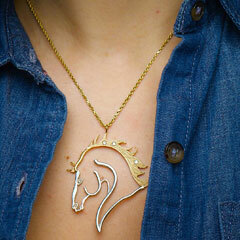 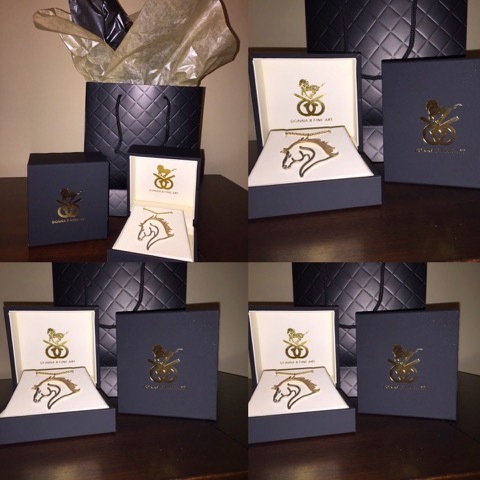 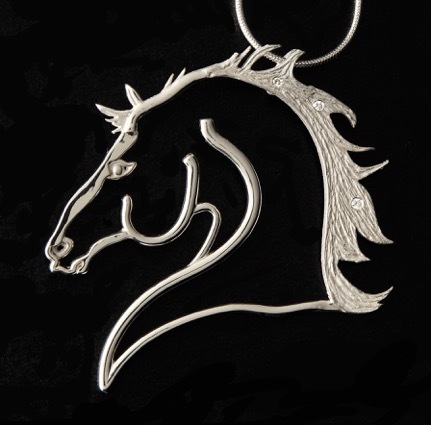 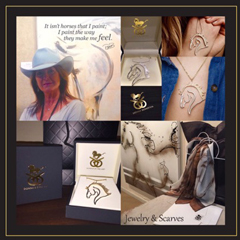 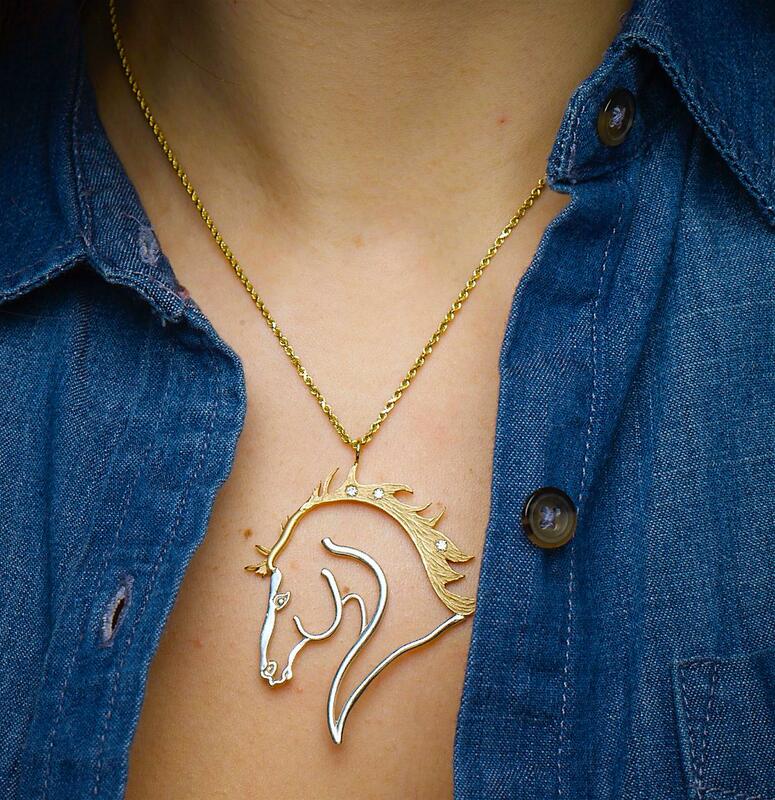 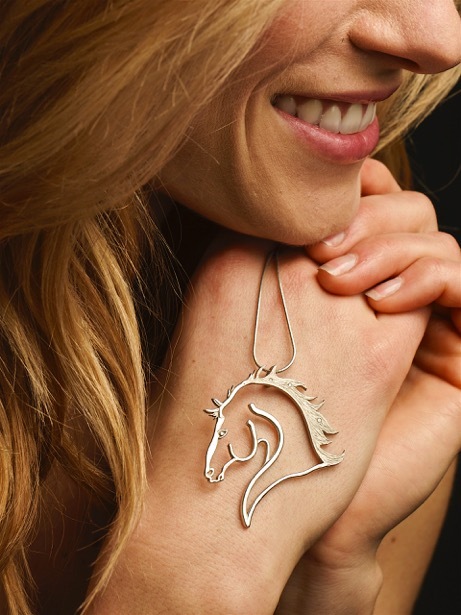 Compelled by this same sensibility and with a love of modern equine art and fashion I have designed uniquely elegant equine jewelry. 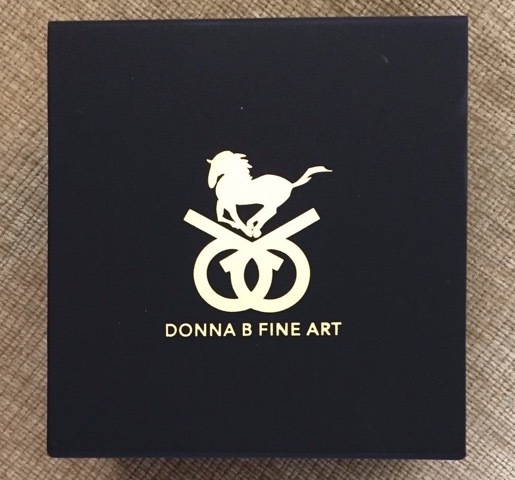 The Donna B Diamond brand is made with the finest materials, by artisan jewelers, and created to last a lifetime. 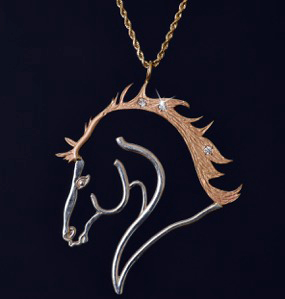 Heirloom pieces that enhance memories for years to come. 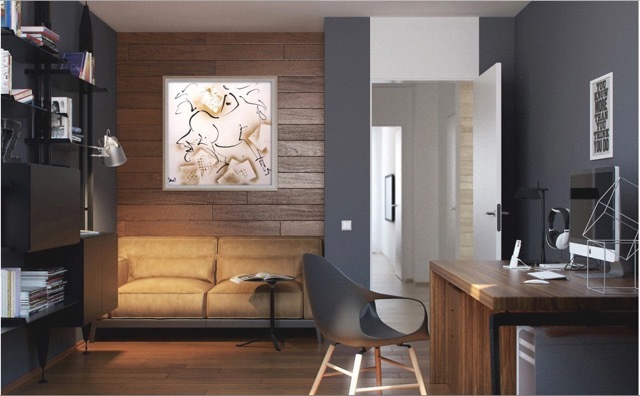 In my first Collection, "Equilibre", it is all about balance. 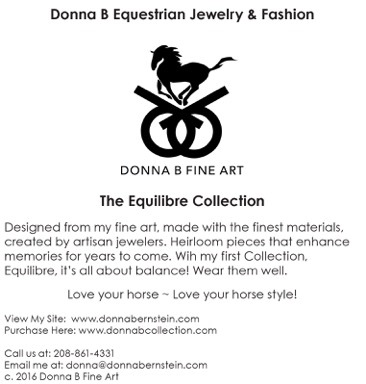 Shop the “Equilibre Collection” here. 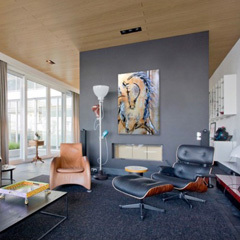 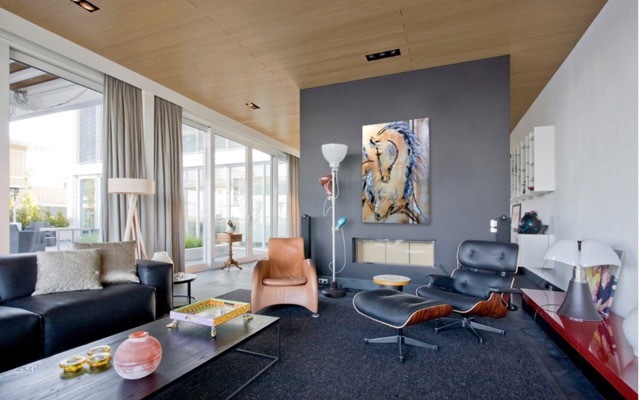 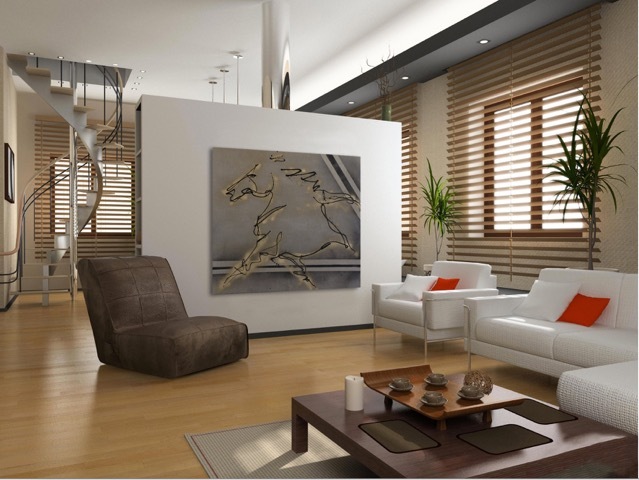 Equine empathy and warmth, classic nobility in a modern style; as you can see, the art of the horse belongs in every room in the house. 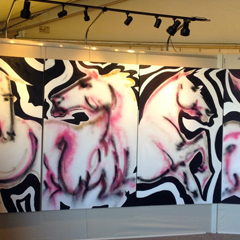 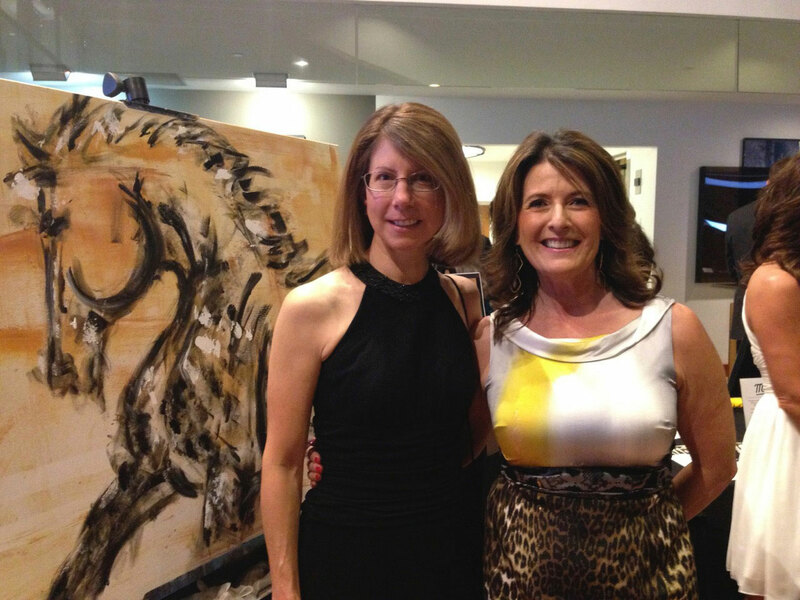 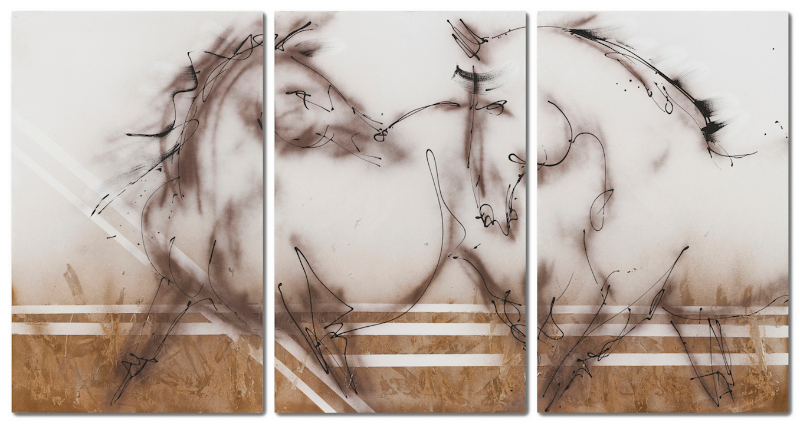 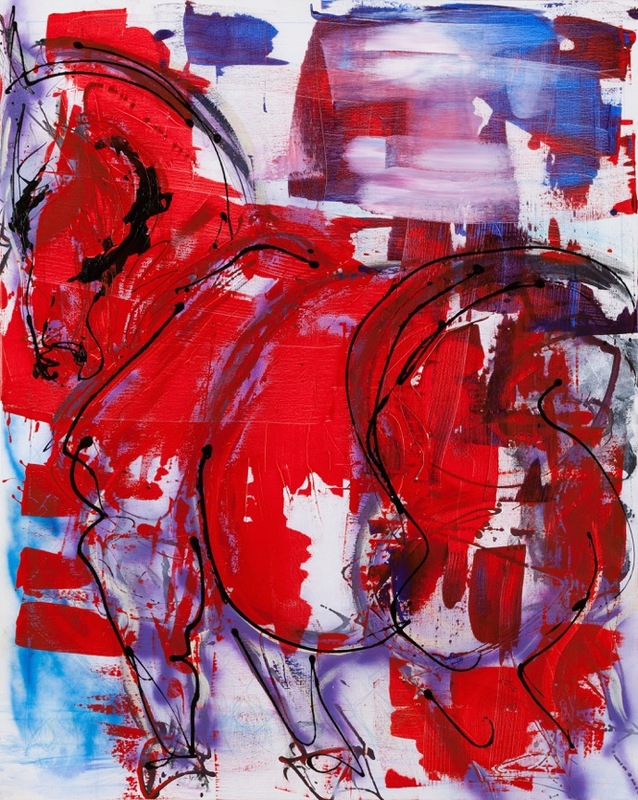 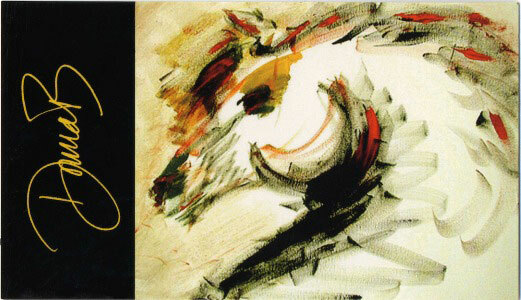 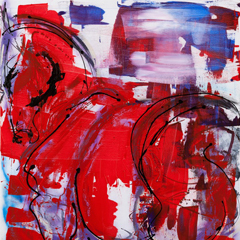 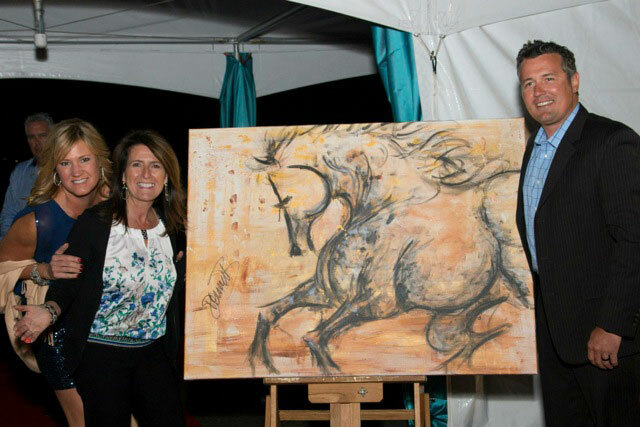 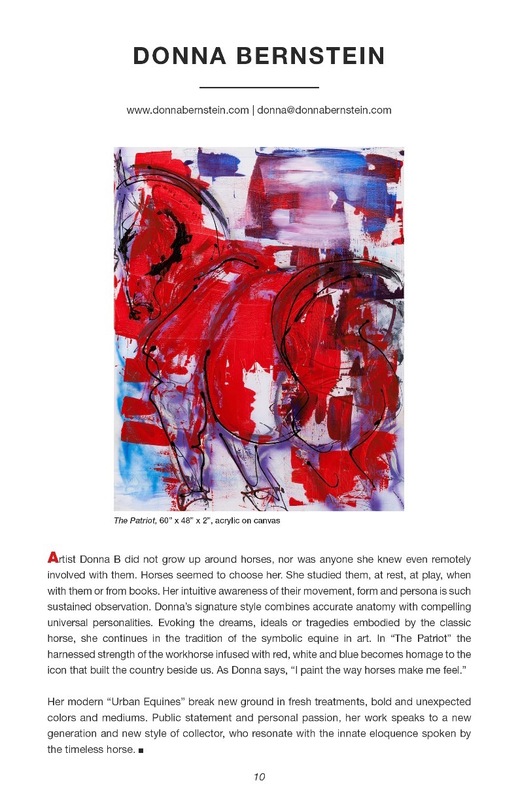 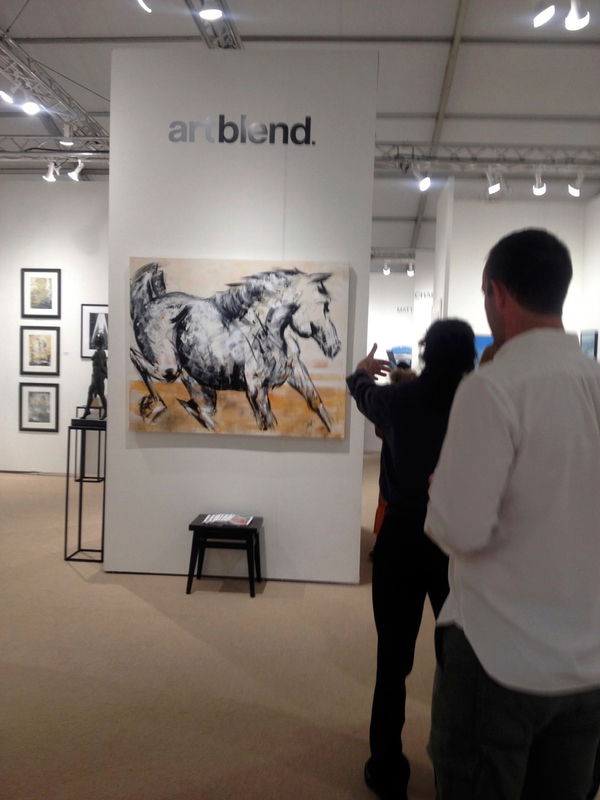 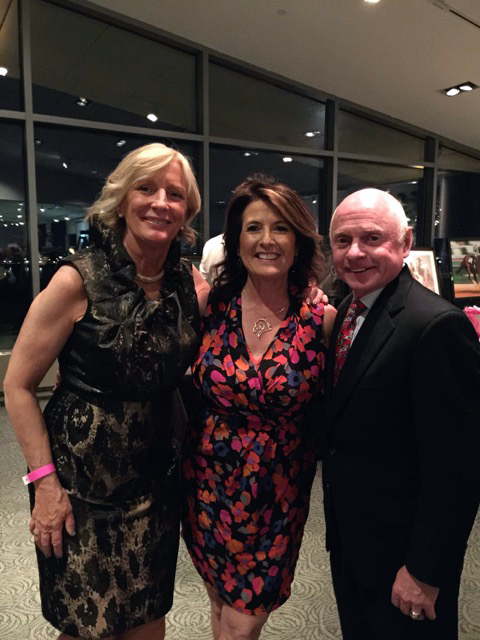 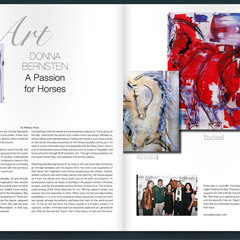 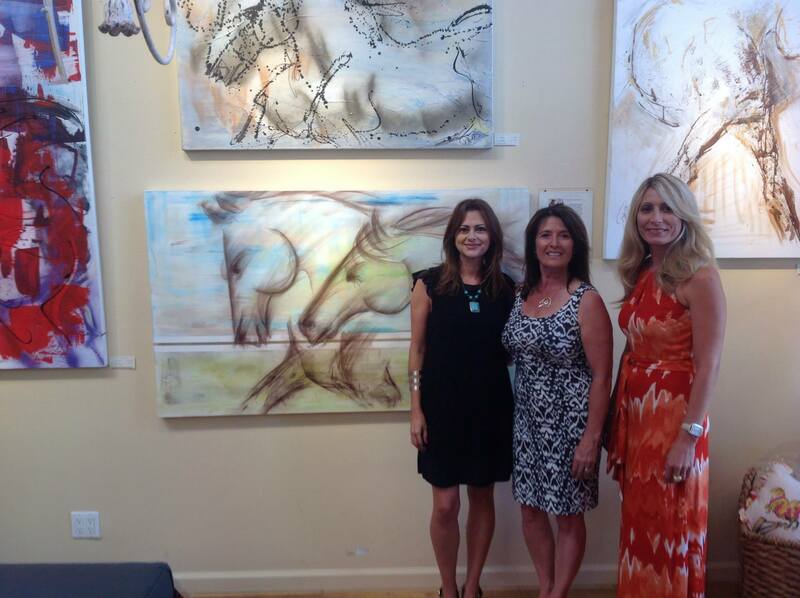 "Combining her talent for classic modern art, Donna Bernstein strikes viewers with the beauty that the horse entails. 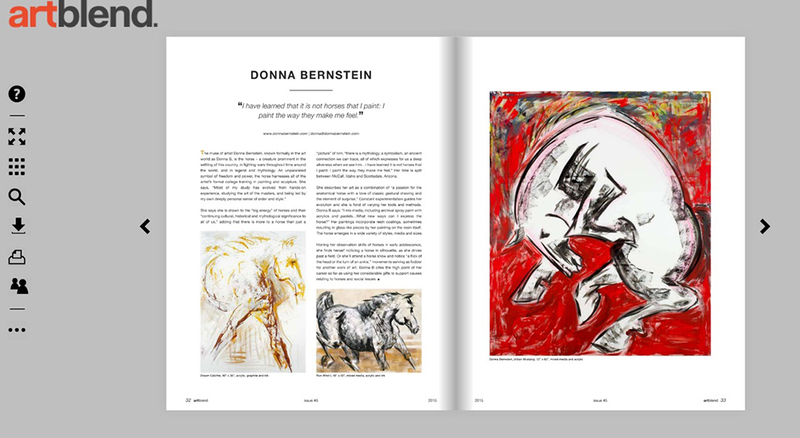 A New York native, Ms. Bernstein paints with subtle, serene colors combined with pulsating power with the horse at its accent." 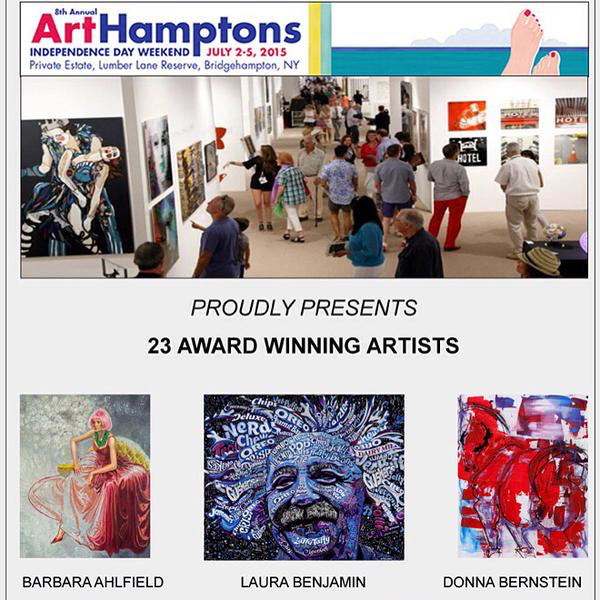 What could be better than Summer + Hamptons + Art?? 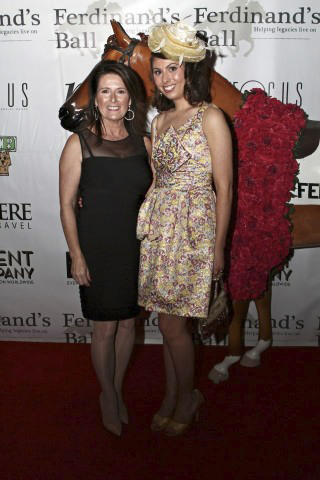 #NewYorkNewYork and here I come! 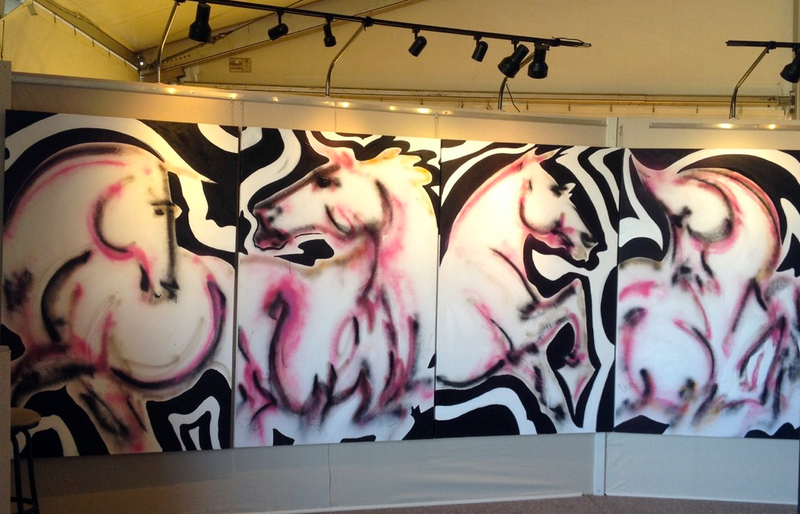 The Hamptons Art Fair is one of the most prestigious in the country, held in Bridgehampton this year on July 2-5. 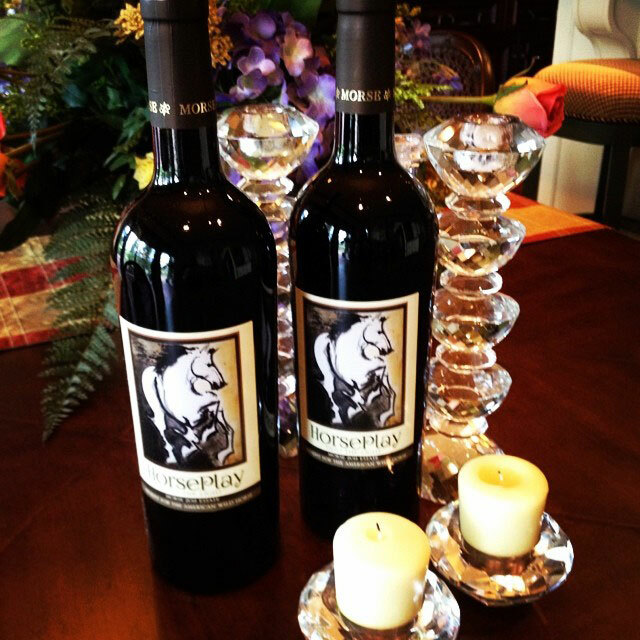 Should be an amazing 4th of July weekend. 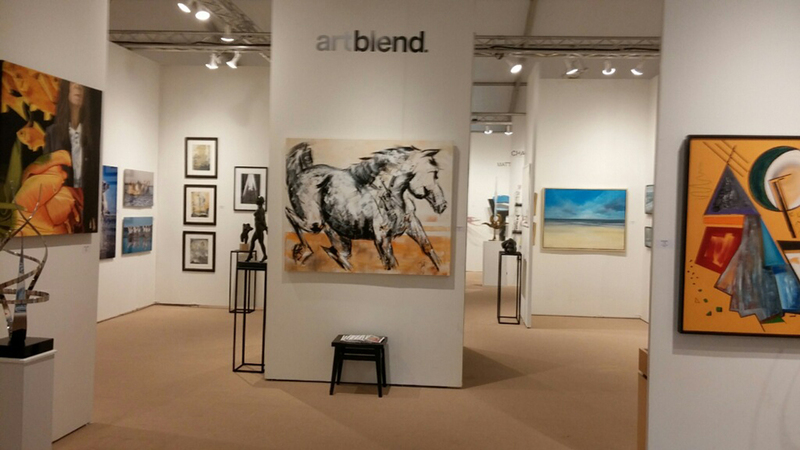 See me in Booth 108 & 208 with ArtBlend Gallery. 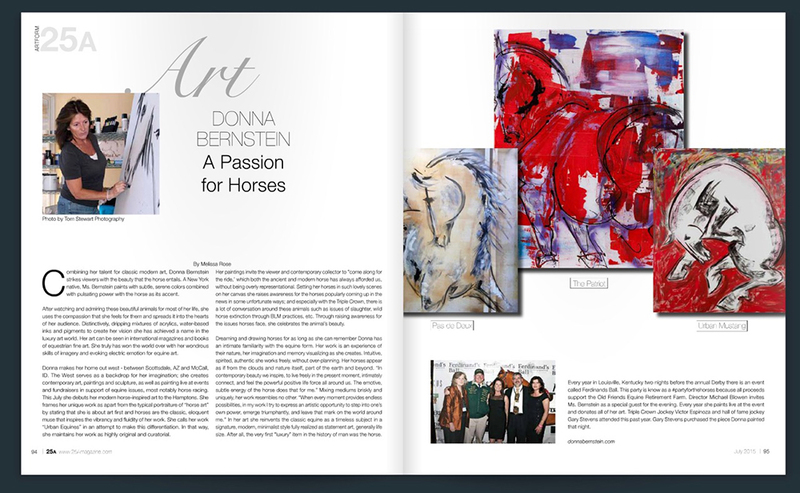 I am so honored to be a part of this show this year - debuting my “Urban Equines” and Modern Equine Art to New York, in the most beautiful venue possible. 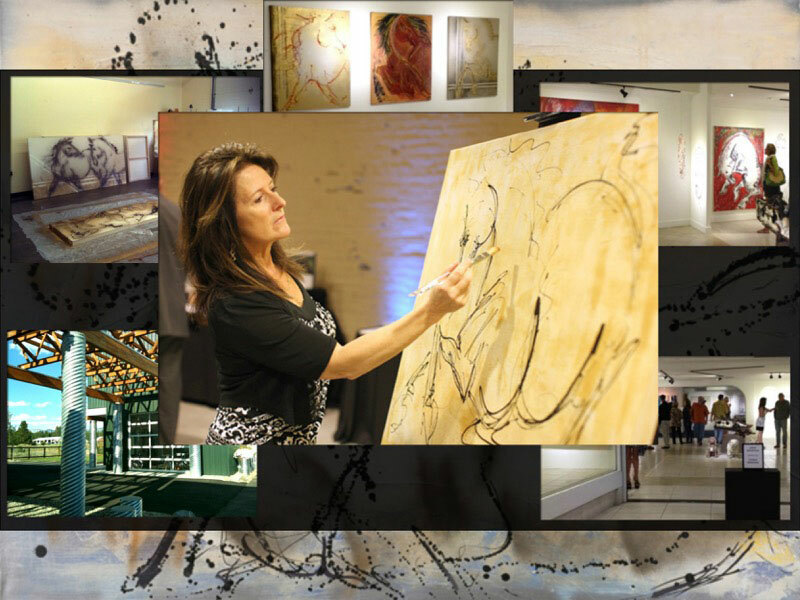 Look forward to seeing you there! 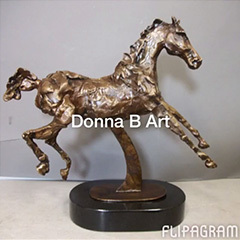 The first year of Ferdinand’s Ball I did not attend but I did send a beautiful piece of sculpture,”Buck”, in support of their efforts to help fund Old Friends Farm in Georgetown, KY. 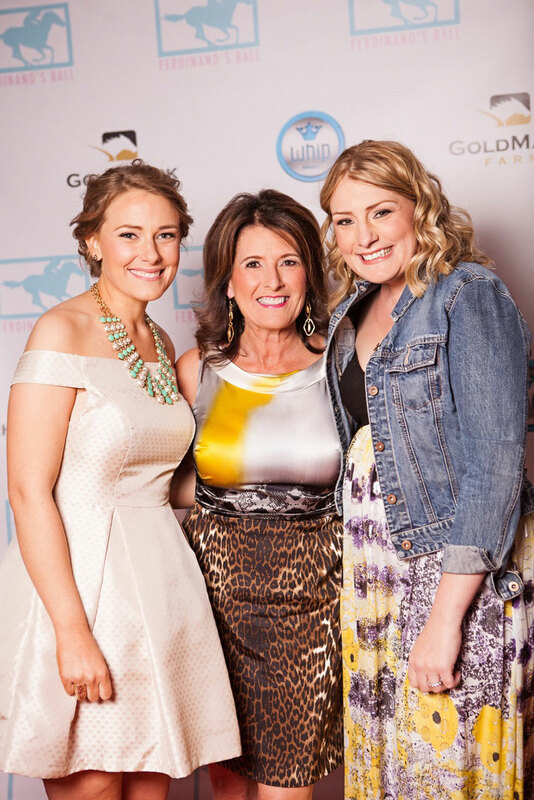 The two beautiful young sisters, Kim Boyle and Aimee Boyle Wulfeck, bravely welcomed me the following year to come to the event and Paint a piece of art Live, during the event, which would become part of their Silent Auction ~ and I have been doing it ever since! 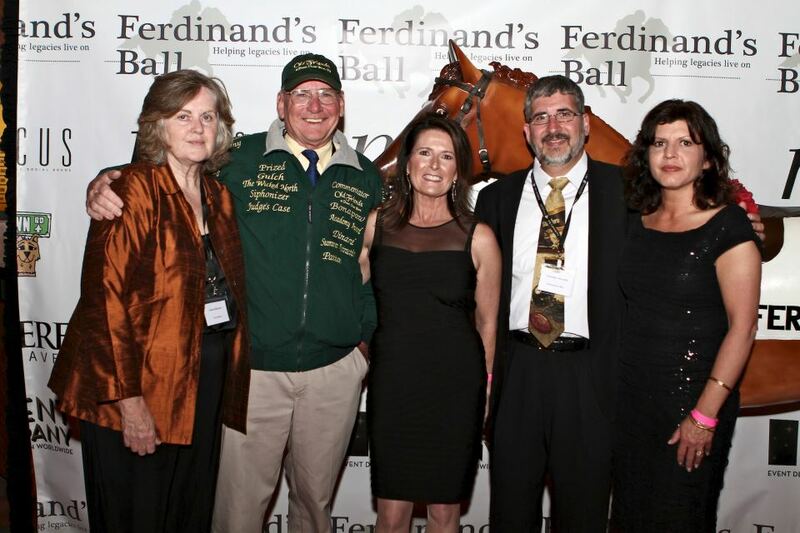 The Party has grown in popularity year after year, drawing more and more attention to their mission, ad their cause: Provide dignified retirement facilities to the many amazing racehorses that have provided joy, value, beauty, ride, and in many cases millions of dollars, once they can no longer perform either on the track or at the stud farm. 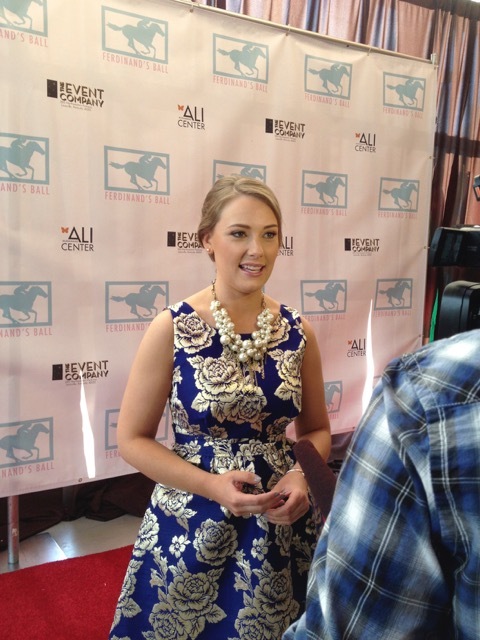 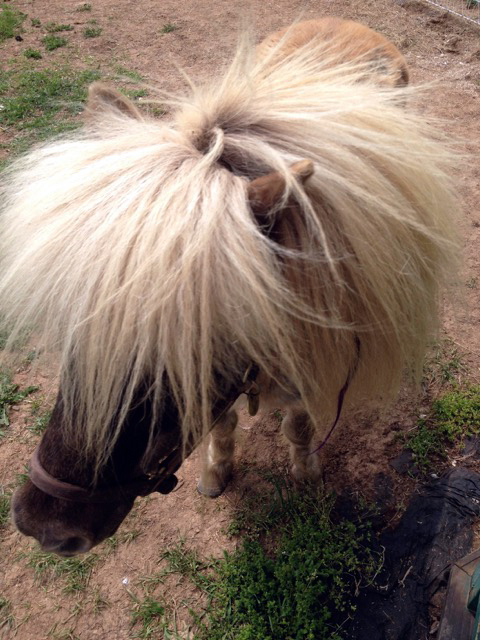 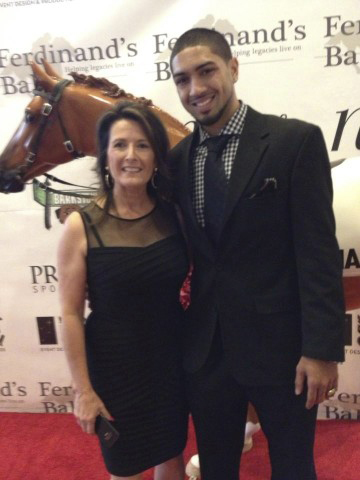 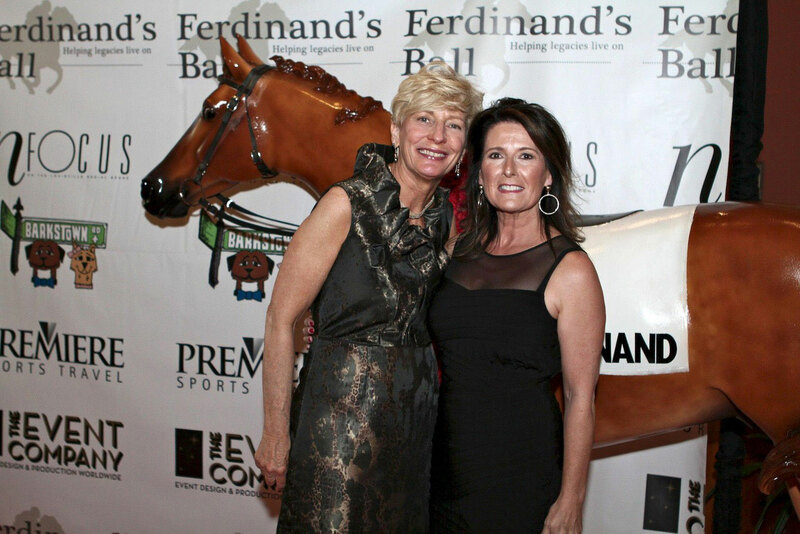 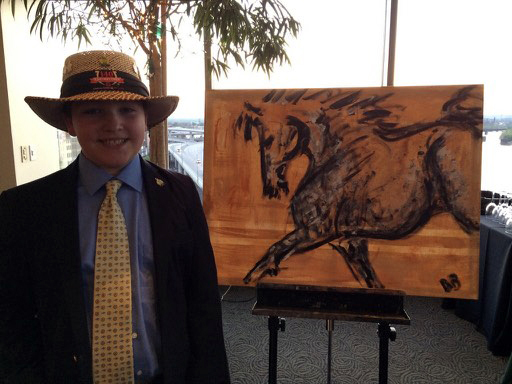 Ferdinand’s Ball remains the only Derby Week Celebrity event that supports - the horses!!! 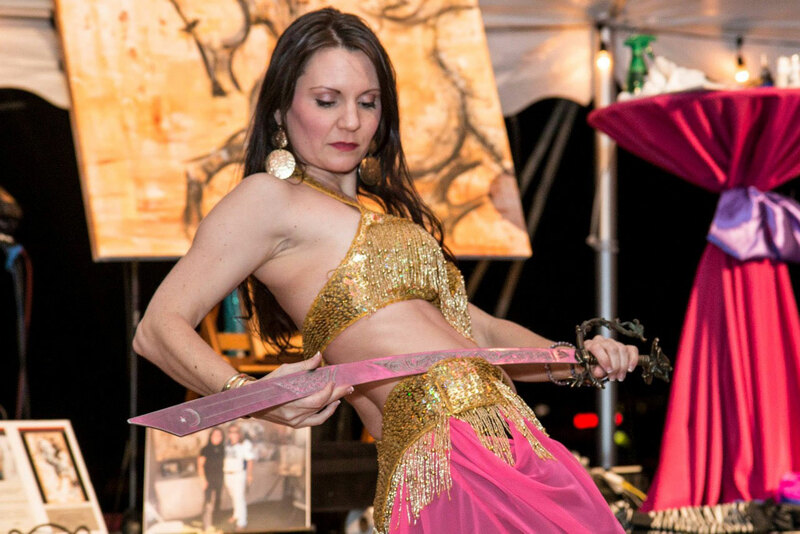 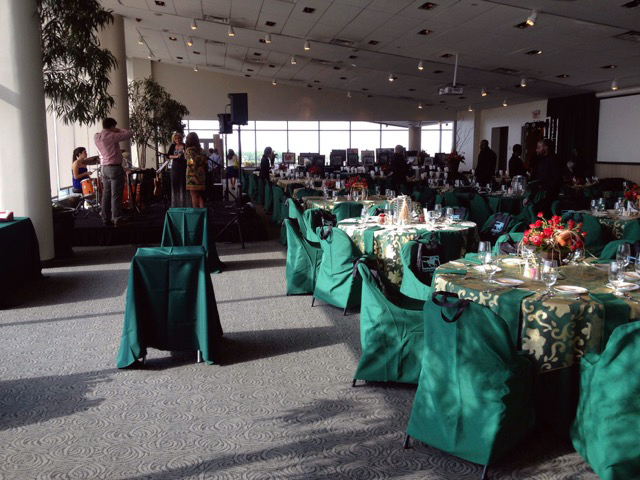 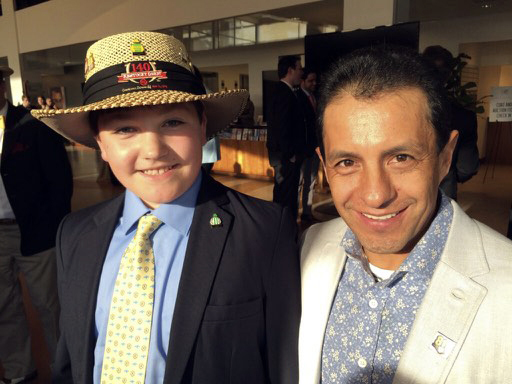 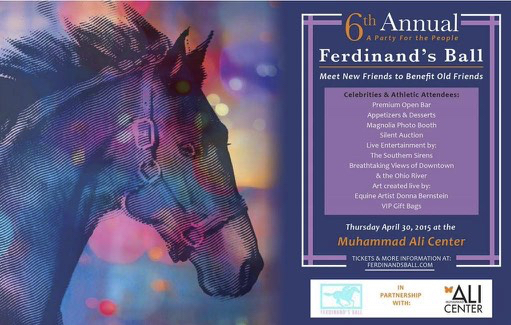 Held every year on the Thursday evening before the Derby - it will be on May 5, 2016 - it takes place at the Muhammed Ali Center in downtown Louisville. 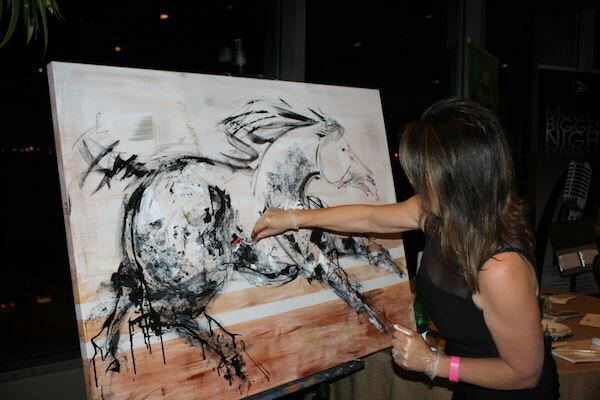 How fitting - that “The Greatest” - supported compassion for all. 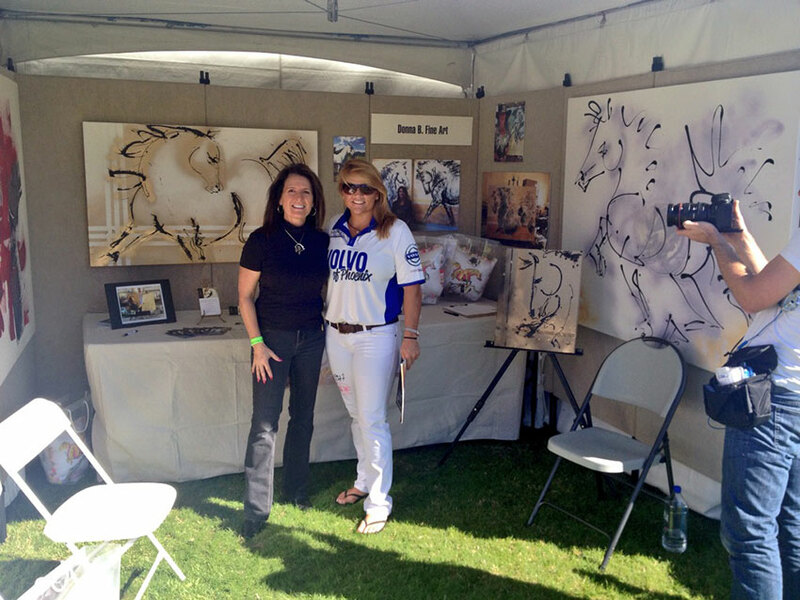 Visit the website - Watch the Video, and please consider this event in your Derby plans. 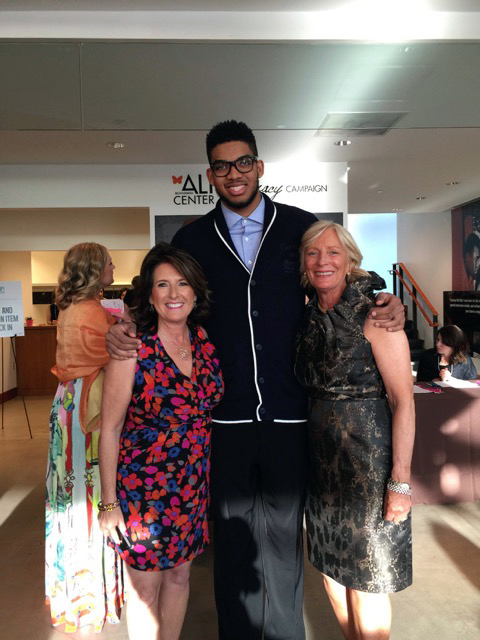 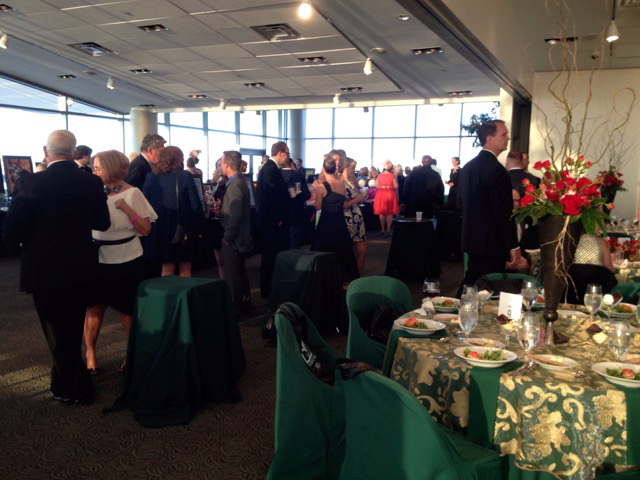 It is a night to remember - for a very special cause. 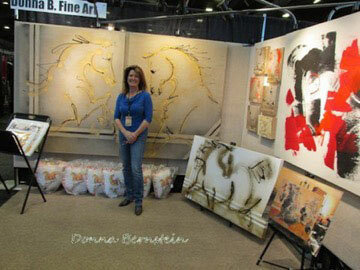 Look for me next at ArtHamptons, NY in July. 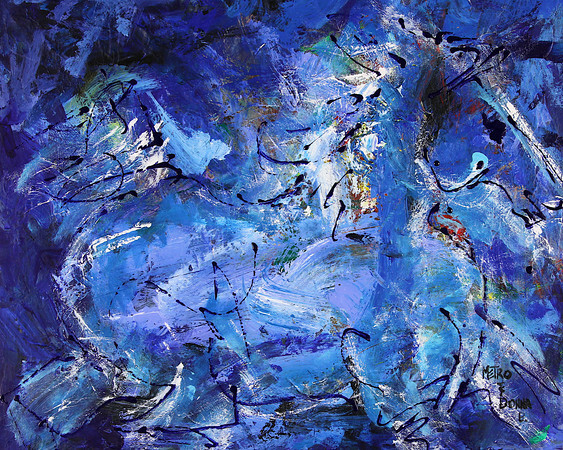 Reach out at any time with any questions or requests regarding my work - and see the newly installed paintings on the “Installations” link on this website. 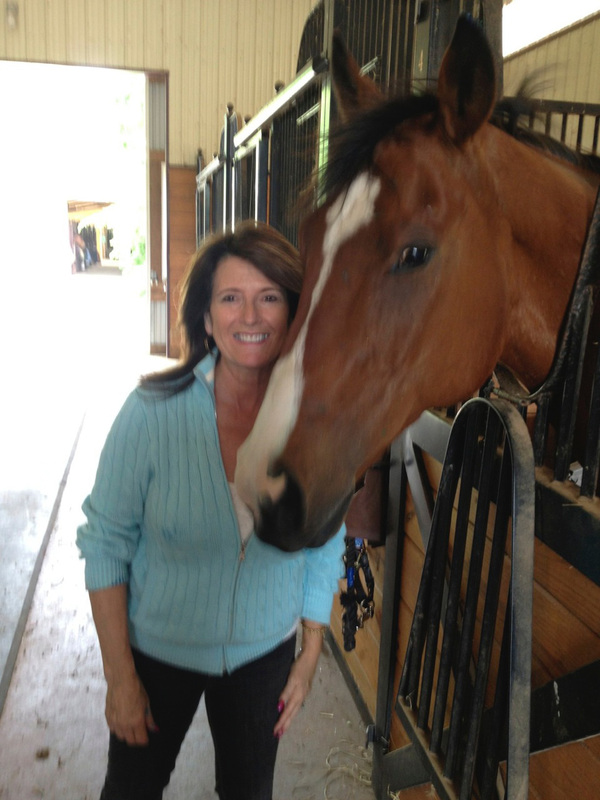 I always look forward to hearing from you - don’t be shy! 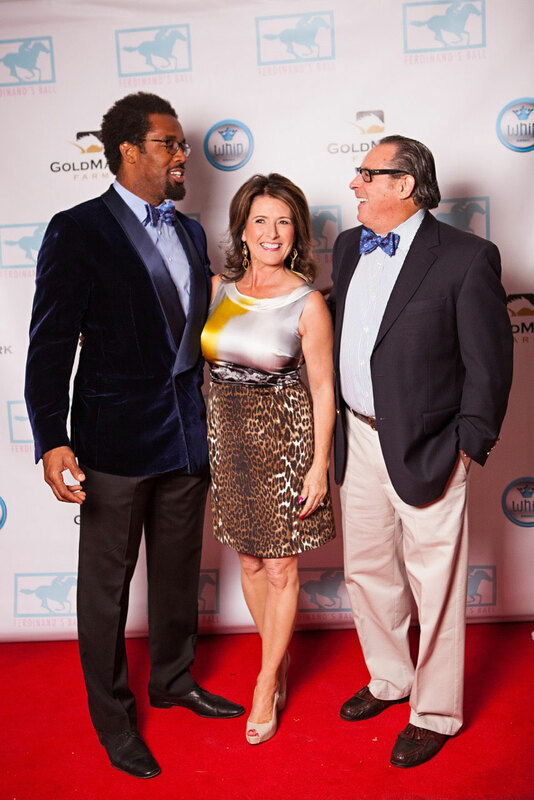 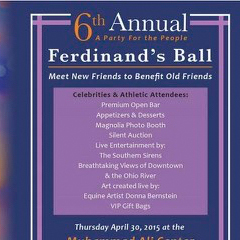 Please Join Me on April 30 at the Muhammed Ali Center in Louisville, KY for Ferdinand’s Ball! 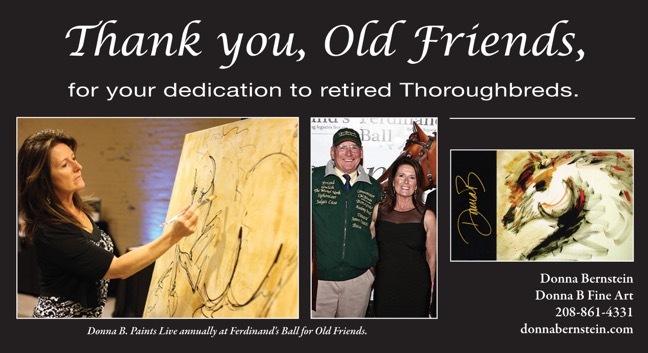 A very special event near and dear to my heart - Come and Support these amazing Thoroughbreds to help provide the retirement they have earned. 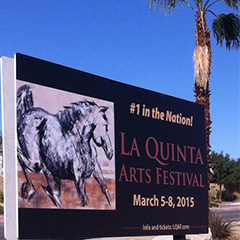 And be sure to visit Old Friends Equine n Georgetown, KY.
Join Me at La Quinta Arts Festival! 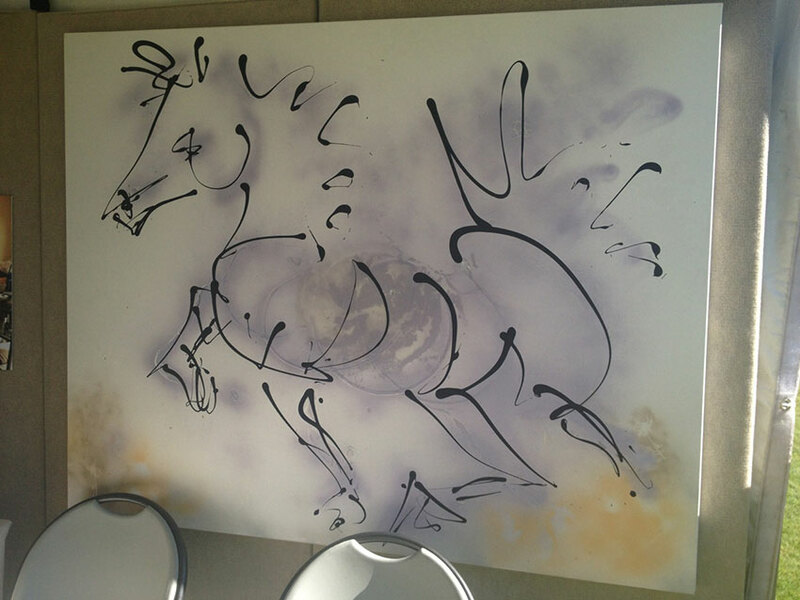 Why Am I An Artist...? 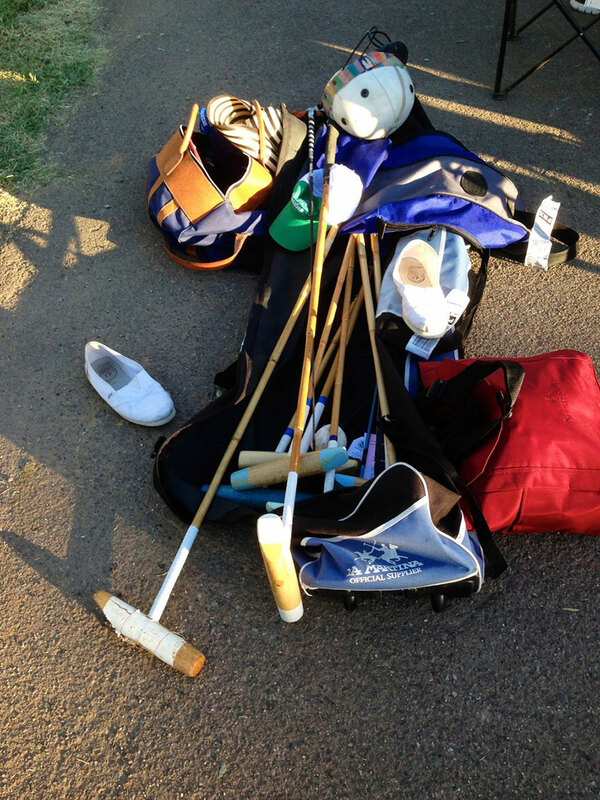 Sometimes something happens and it fills in all the spaces. 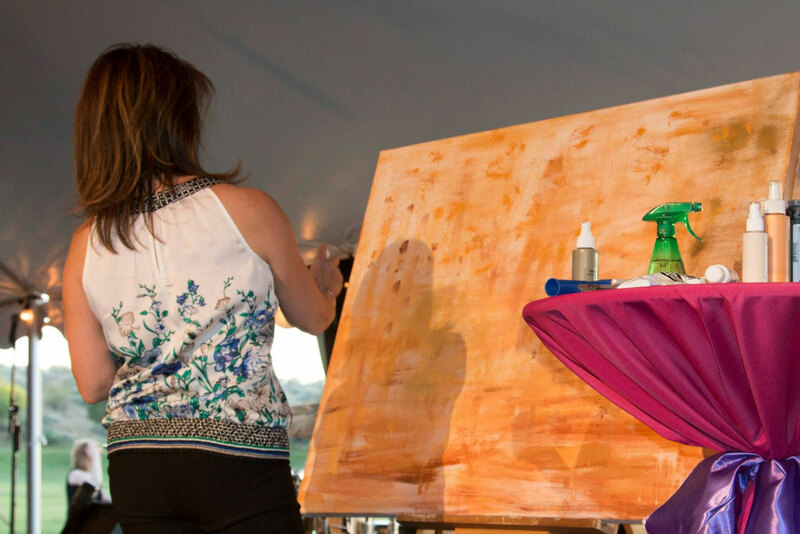 As a working artist you are your own CEO. 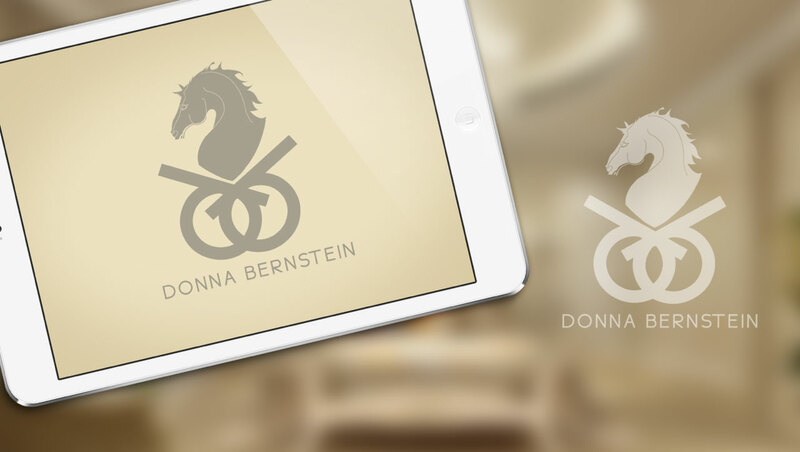 There is art to be created, and business to be conducted. 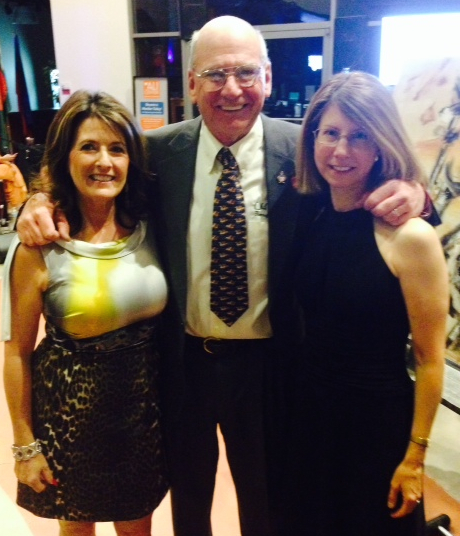 But every once in a while something happens that reminds you why. 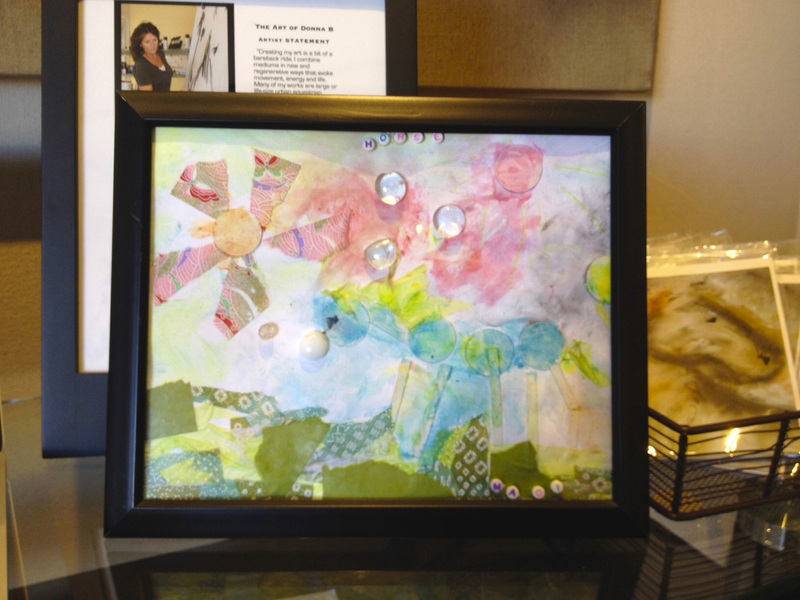 Three weeks later they stopped in, this time with a small framed collage piece that Madeline wanted to give me in return. 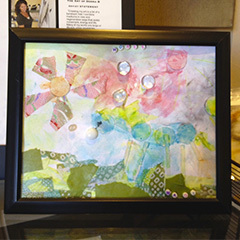 You can see the image here, but only in person can you feel in this gift the shy, kind, quiet generosity of a small child, possessing a creative, caring wisdom. 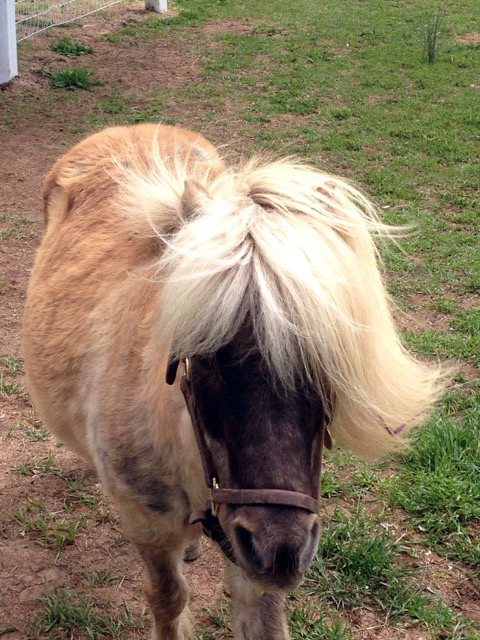 Beauty is where you find it. 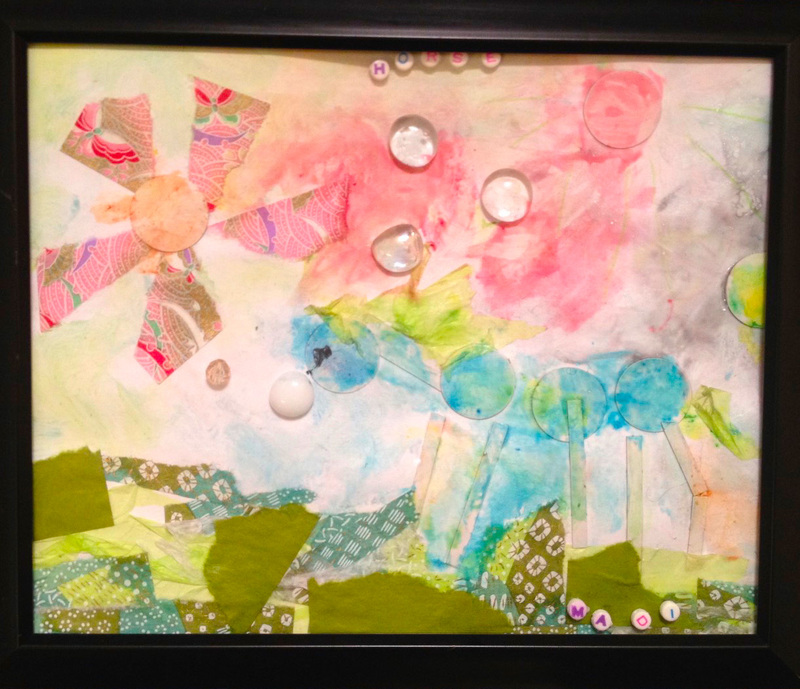 The deepest gift of someone’s heart… in the treasure of a child’s work of art. 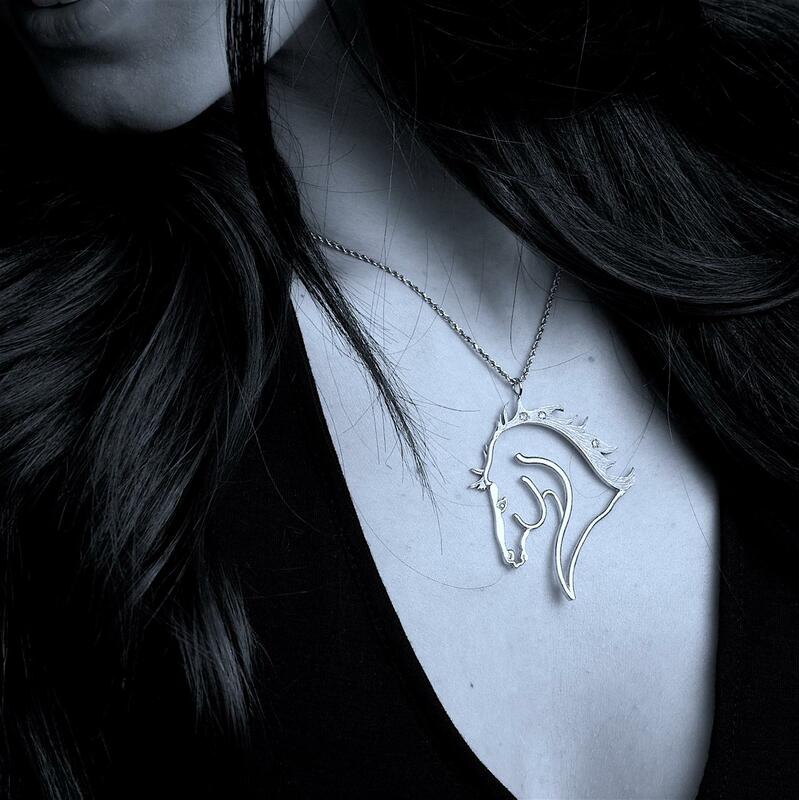 For hiding behind your mother, while showing me your soul. 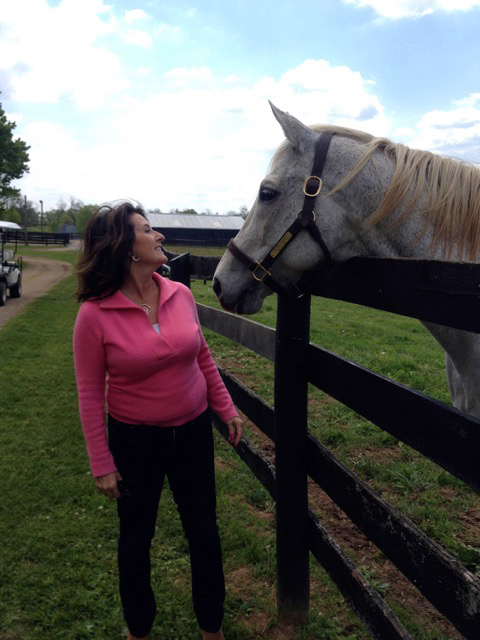 Enjoy this short little piece - about me and my world! 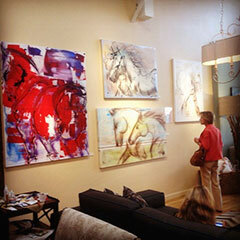 Art is a bit about filling those spaces ... of a heart. 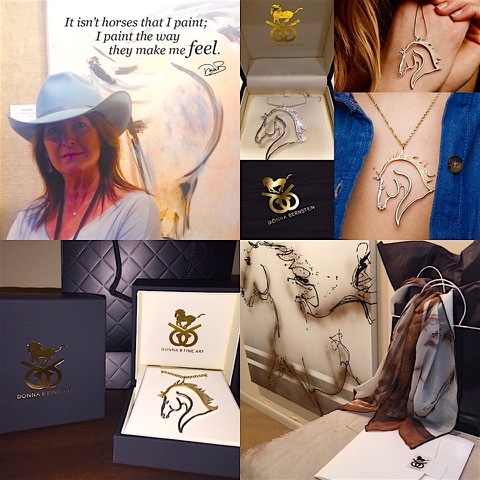 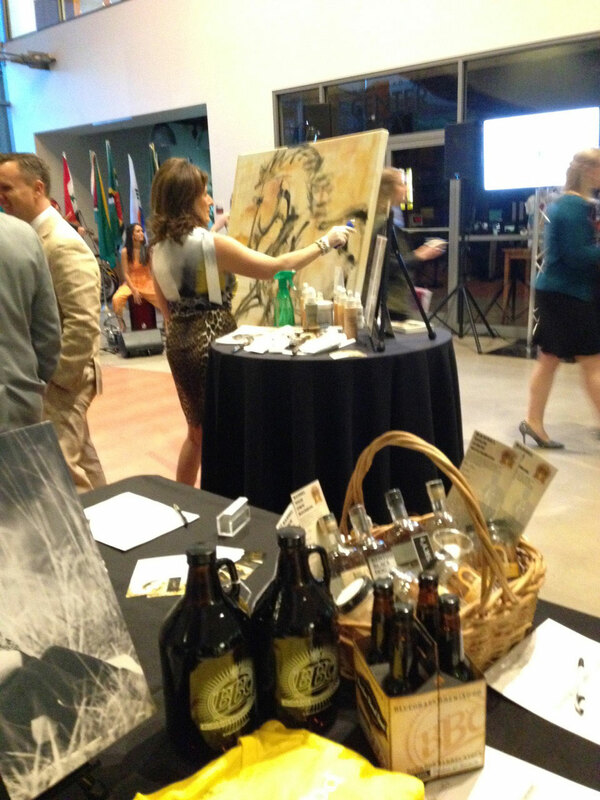 Over the years my work has expanded into an area of style and expertise I might never have imagined - creating original works of art during luxury and branded events with Charity Partners, as a way of enhancing not only the event but raising funds in support of causes I feel strongly about. 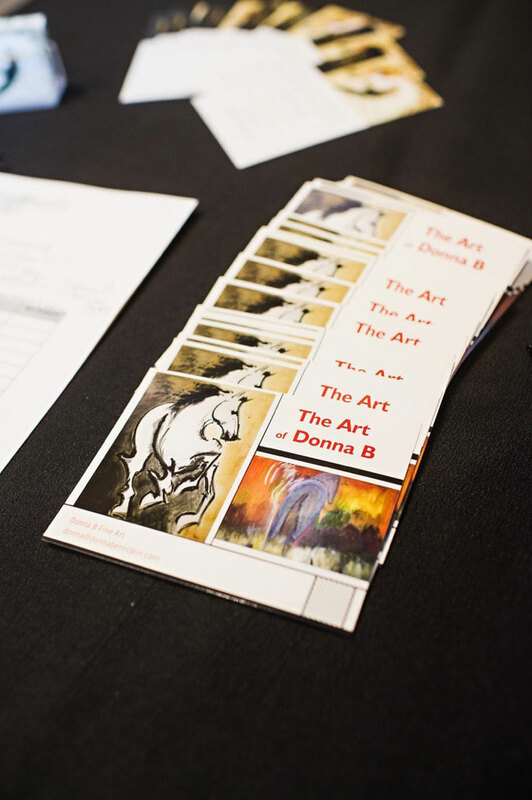 Attached is a portfolio of events and happenings - feel free to reach out at any time if you feel your program or organization could benefit from a unique collaboration with Donna B! 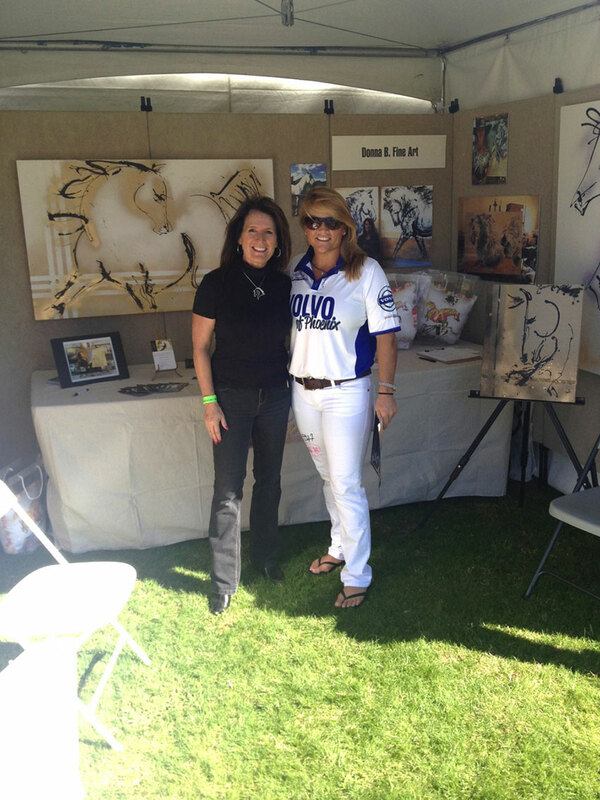 Next Up - The Scottsdale Bentley Polo Party!! 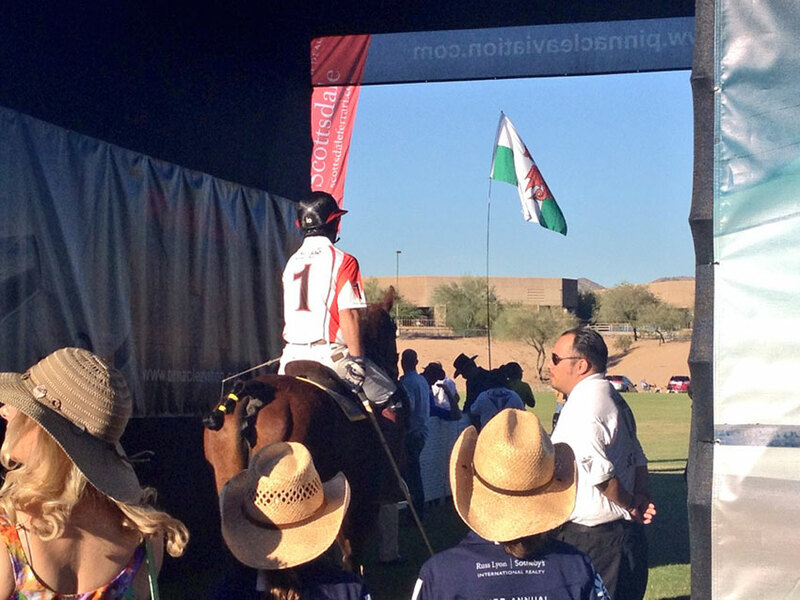 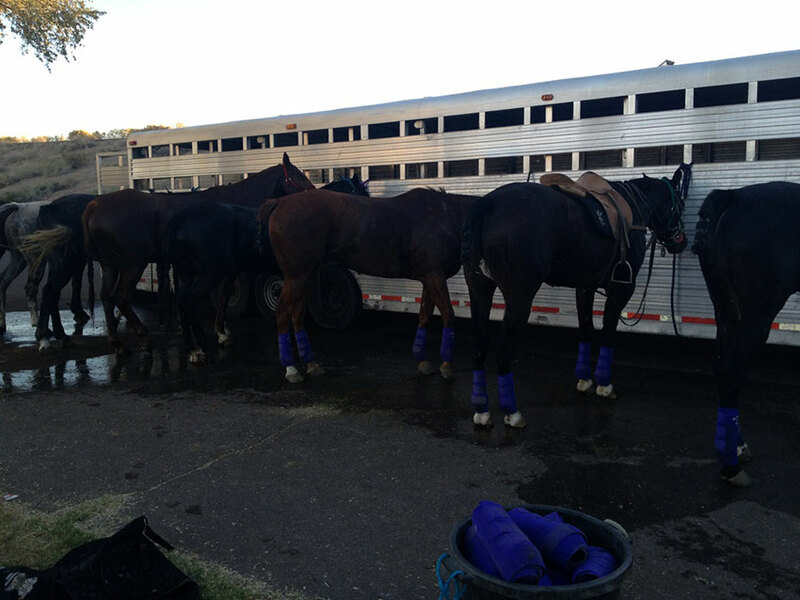 I will be attending the 2nd Annual World Class Polo Event in Scottsdale in a few weeks. 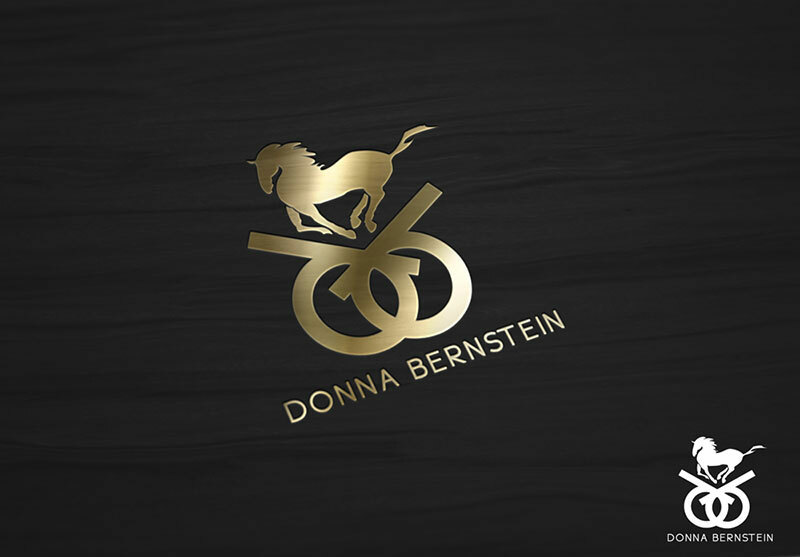 Watch the video - for a sneak peek at an amazing event that combines Horses & Horsepower - Art & Automobiles - High Fashion & High Energy! 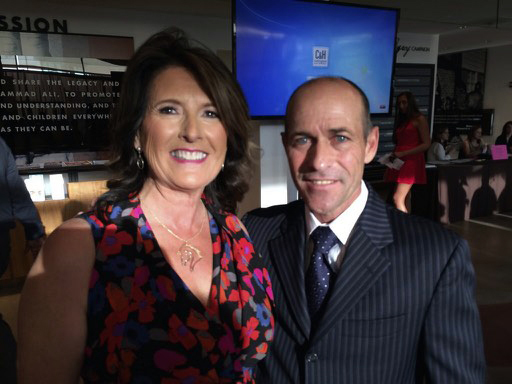 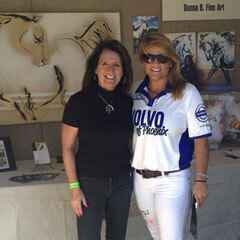 Here I am with Sunny Hale, the top-rated American Lady Polo Player - one of the top 5 in the World. 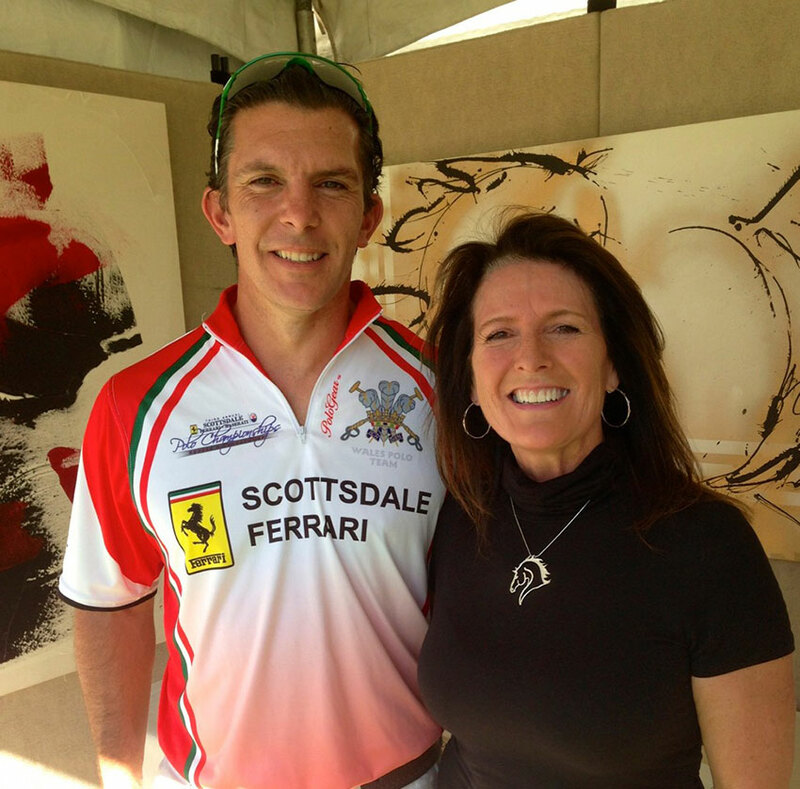 Another picture shows me and Ricky Cooper, Captain of the Wales Polo Team - who won last year and will be back to defend his title. 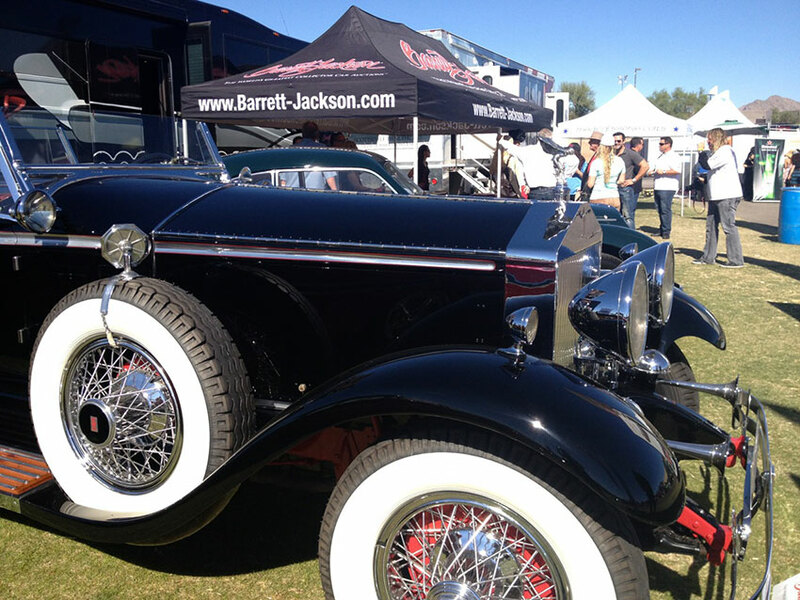 Hope you can join us for an amazing Arizona event, and start off the Holiday Season - in full swing! 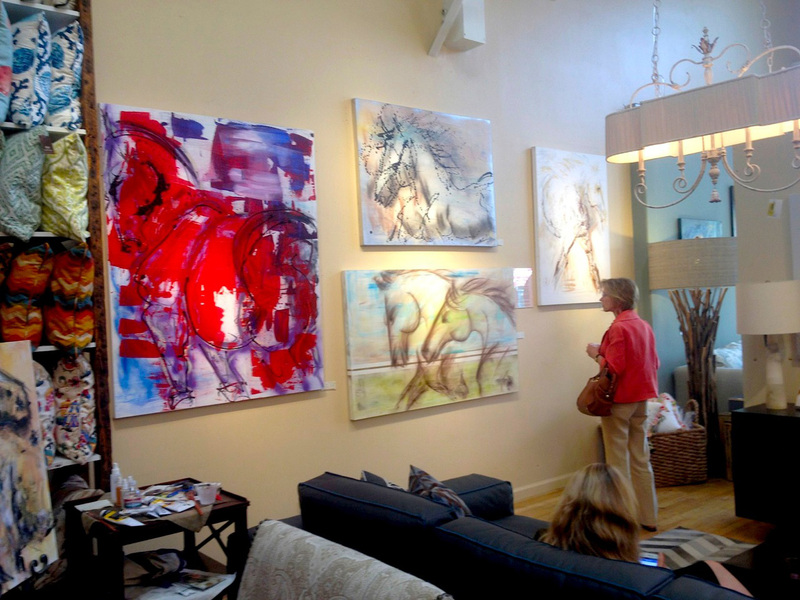 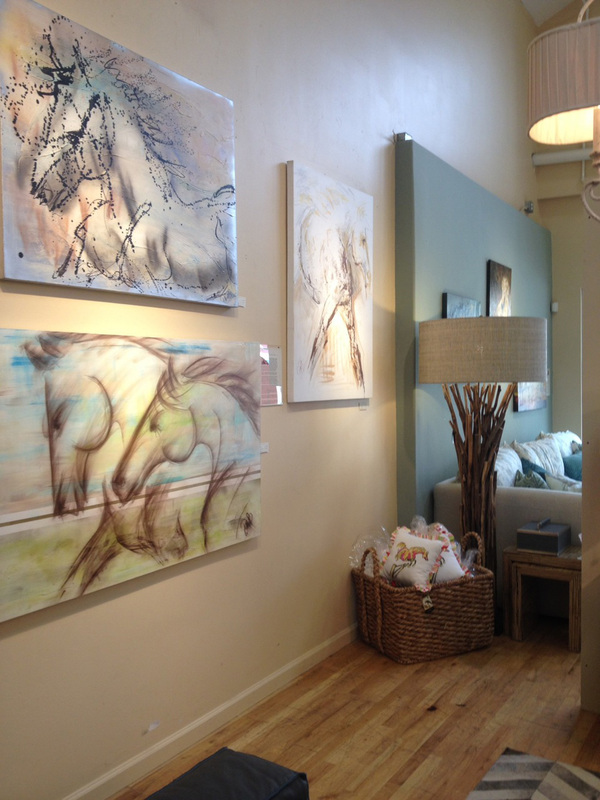 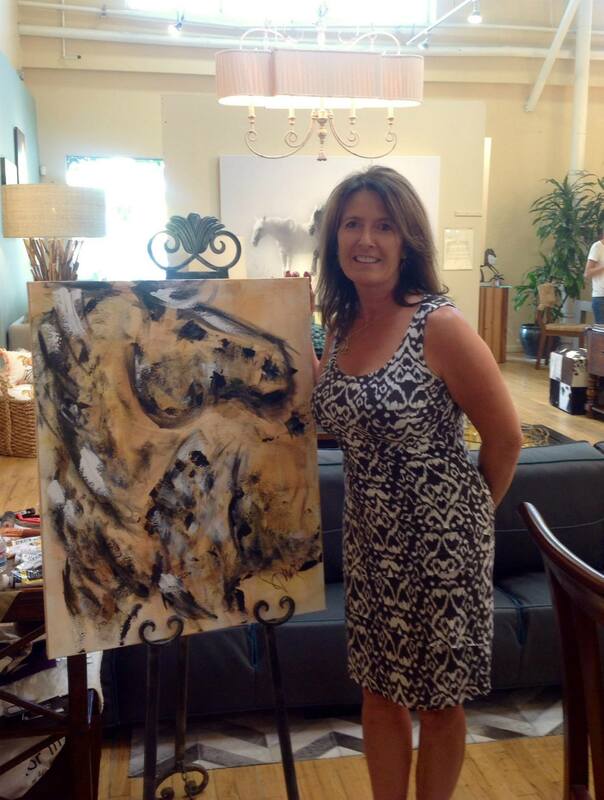 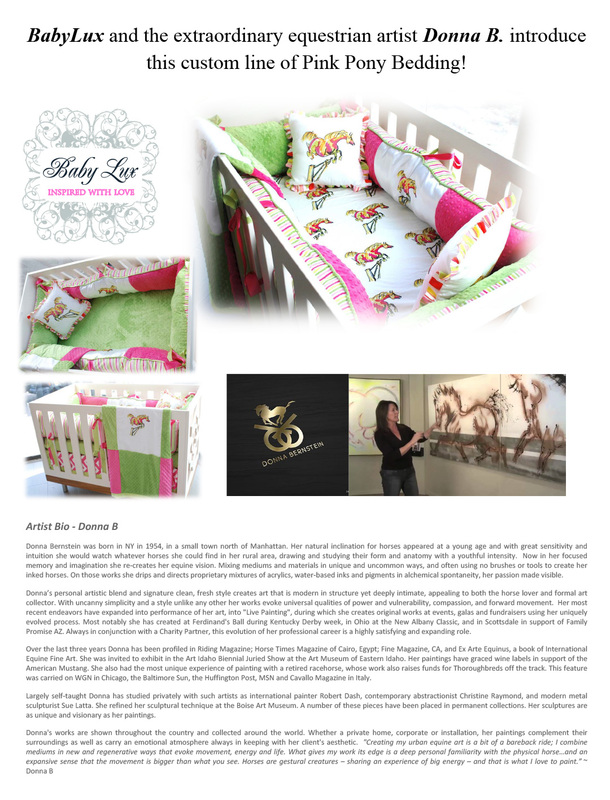 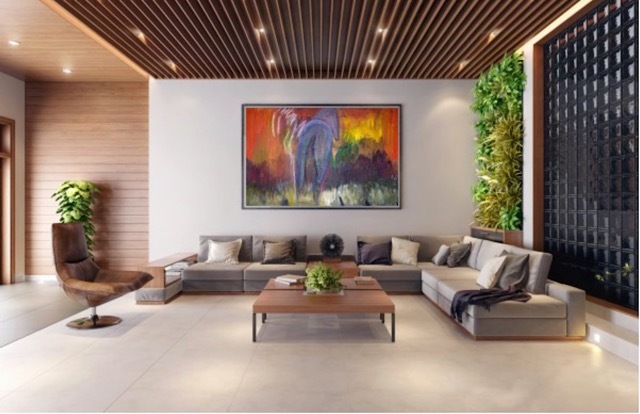 ONGOING Show at Nativa Interiors, 143 S Credos Avenue - in the Design District in Solana Beach. 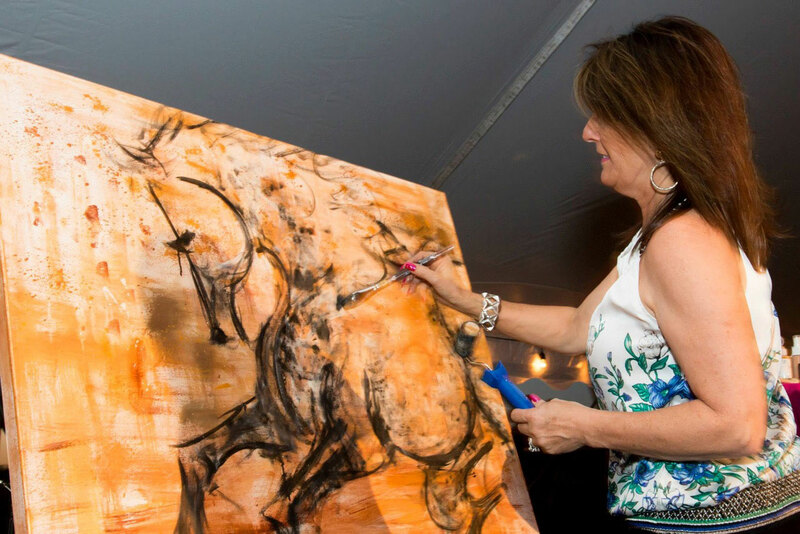 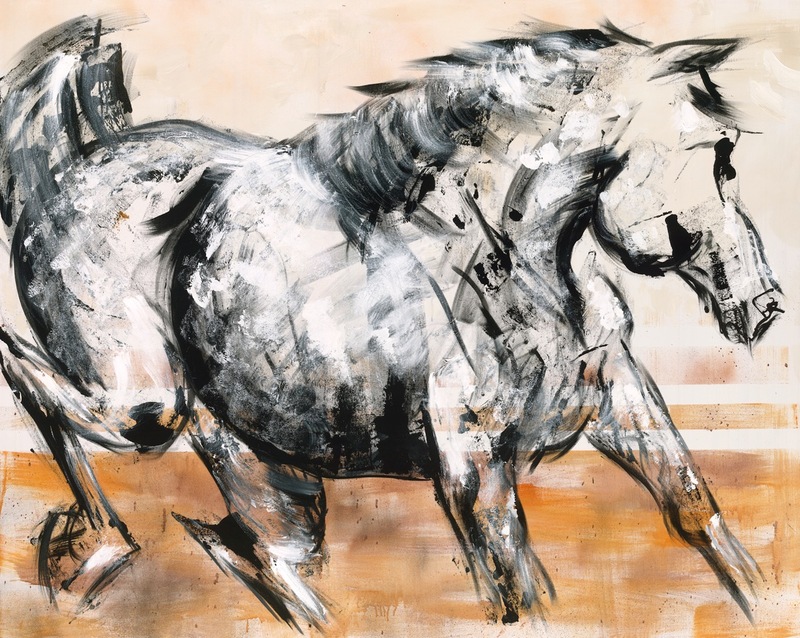 Fine Equestrian art is showcased through the end of August, to coincide with the Del Mar Racing Season - the Thoroughbred Club/Track is right down the street! 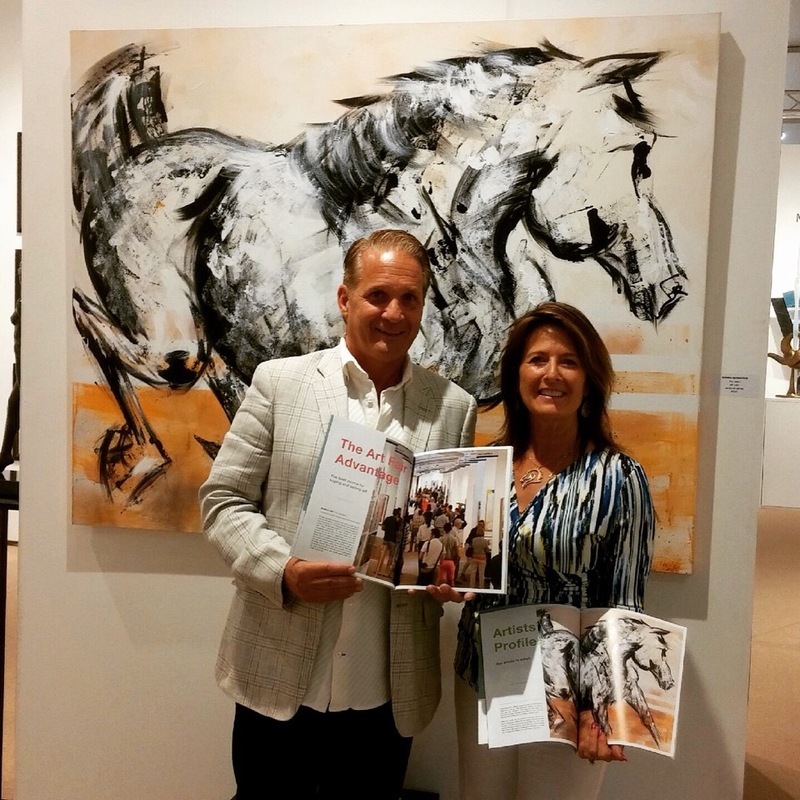 I was thrilled to be chosen to be part of this beautiful exhibit of equine and racing art. 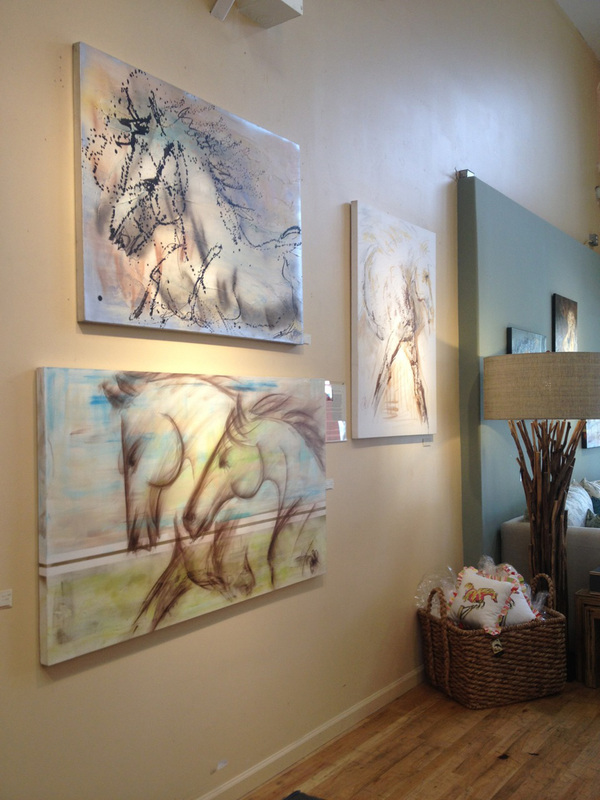 Please stop in if you can. 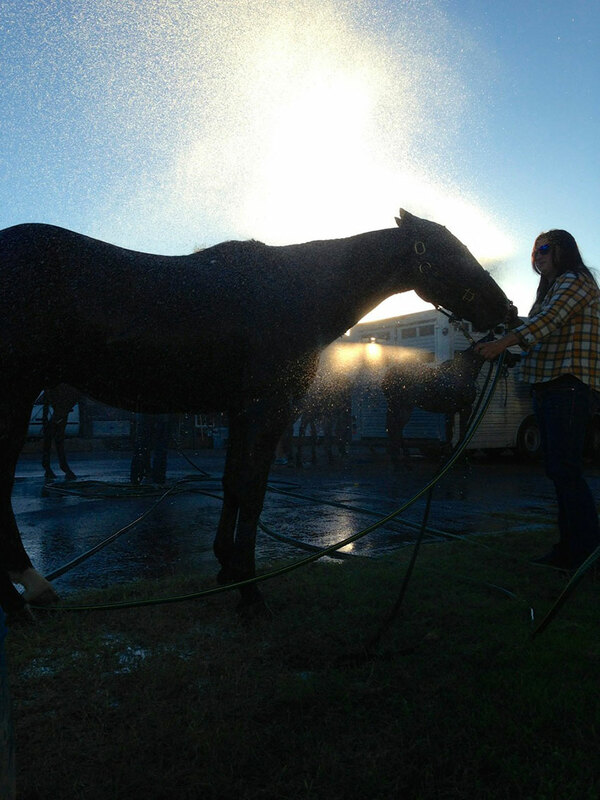 As they say at Del Mar - "Racing at its Best - Where the Turf Meets the Surf" Enjoy! 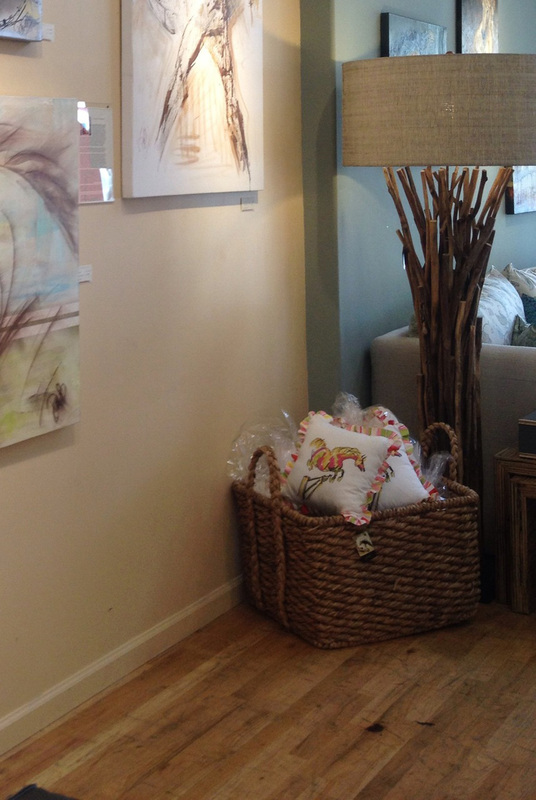 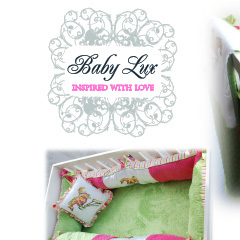 Oh - and you can find my organic Pink Pony Pillows, there, too. 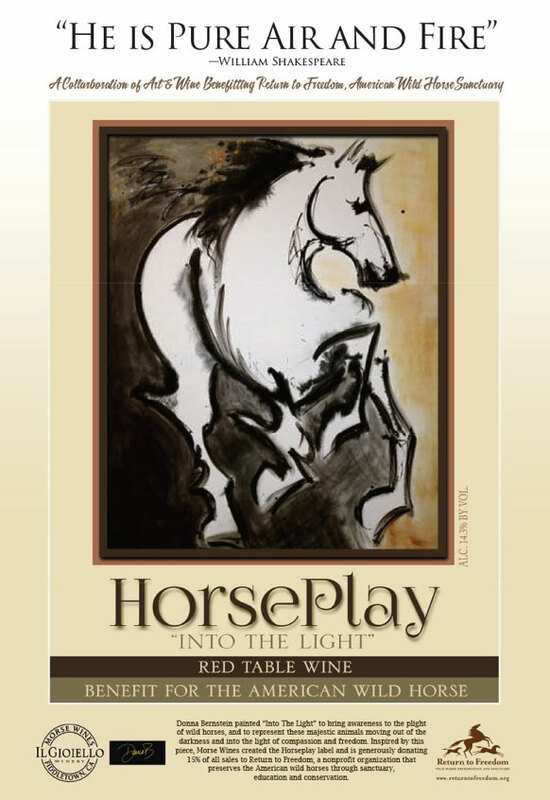 When the owner of Morse Wines Il Gioeillo Winery reached out to me in appreciation of my art, particularly the piece "Into the Light", he indicated he was creating a new vintage of wines, "HorsePlay." 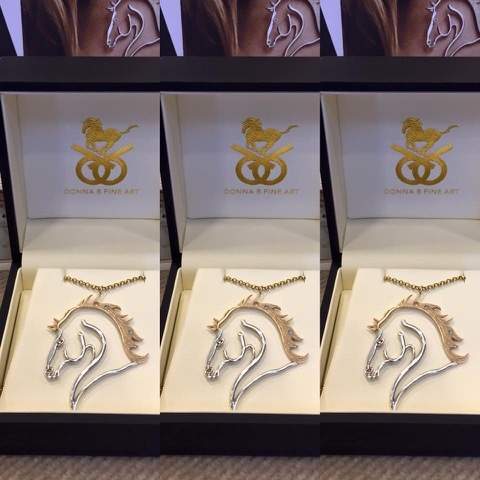 He wanted to use the image for the label, and, by the way, as he and family are horse lovers, he'd love to support a horse cause with a percentage of the sales proceeds..... Was there any in particular that was close to my heart? A match made in heaven! 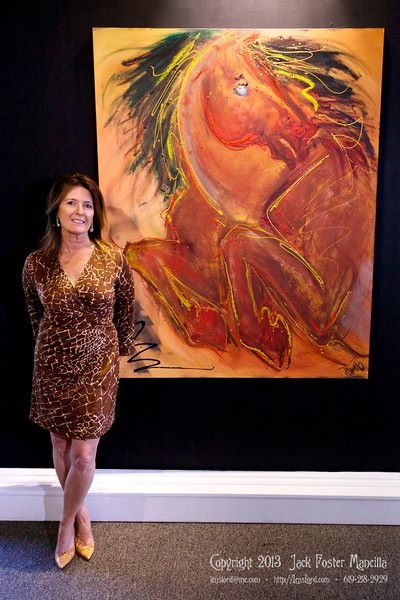 The painting had been inspired by my support of the issues of the American Mustang, representing their movement from the darkness of persecution into the light of perennial freedom. 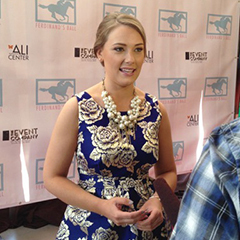 I suggested we work with ReturntoFreedom.org, an organization I had gotten to know while working with a local class of students about these issues. 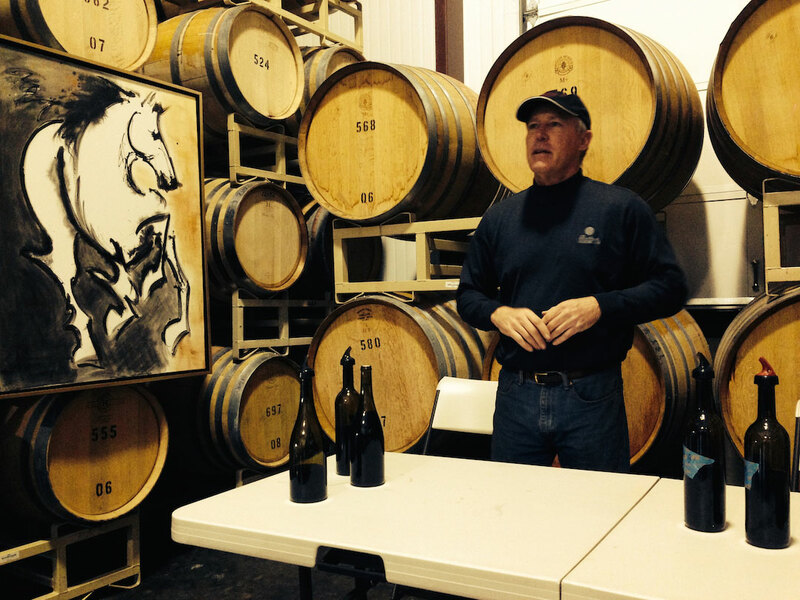 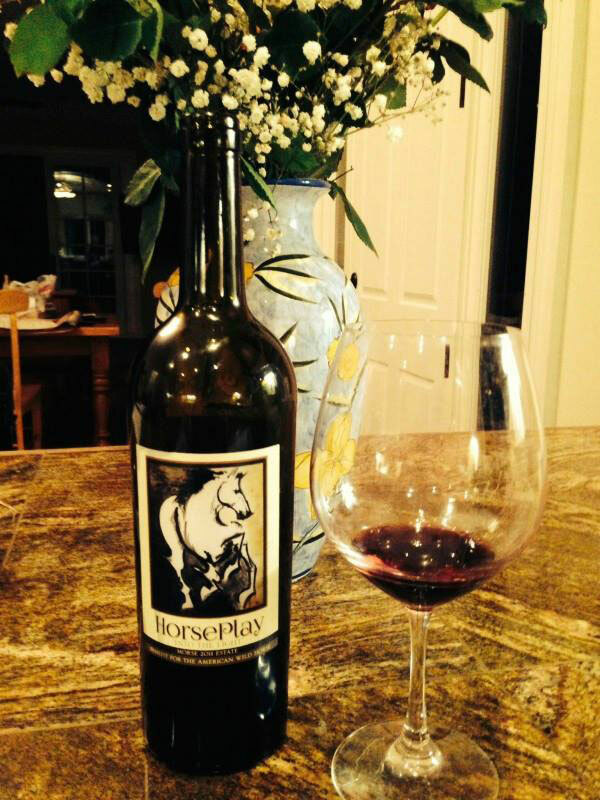 The label was created, the wine was born, a formal launch of a HorsePlay white wine is in the works, the red vintage won Gold at the Amador Fair Wine Competition, the Horse PlayWine Club has been born, and it is available for purchase online. 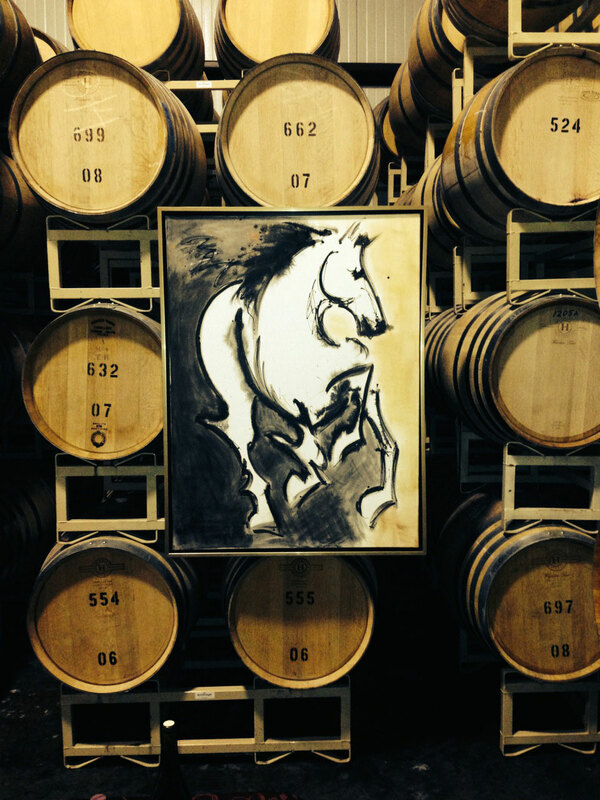 Support the American Mustang, and remember to drink responsibly. 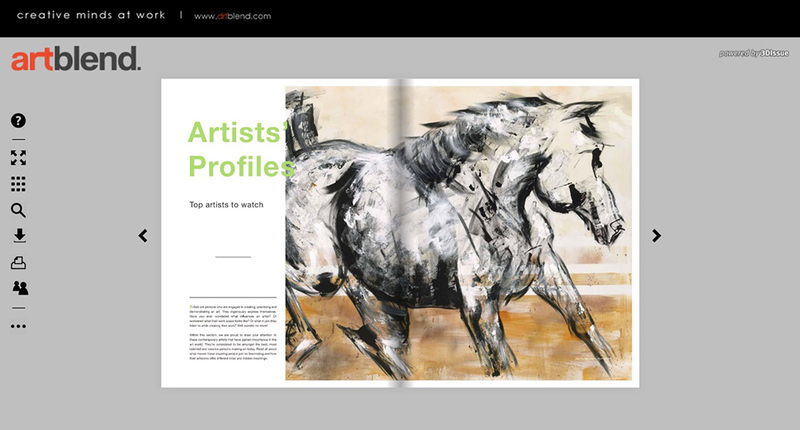 There Are Many Horse Artists - But How Many Artist Horses?? 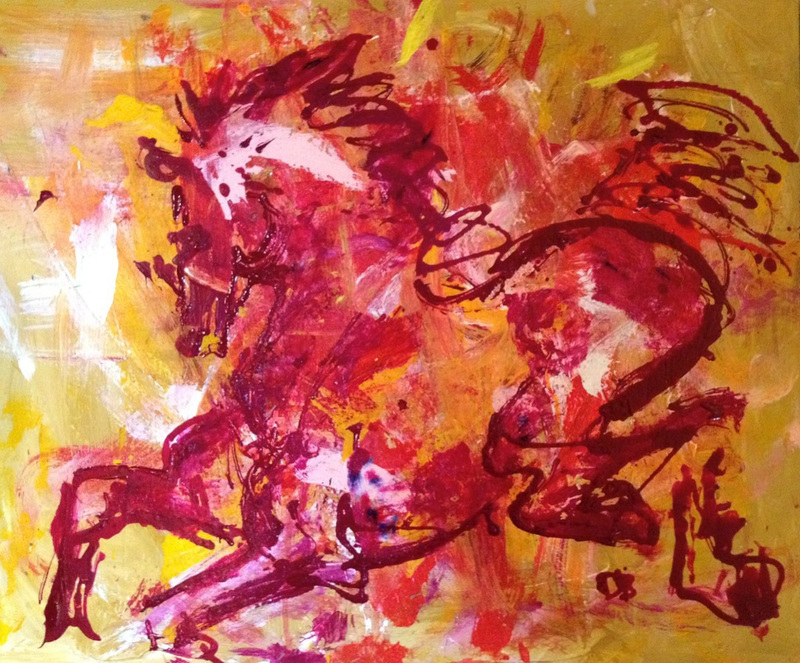 One! 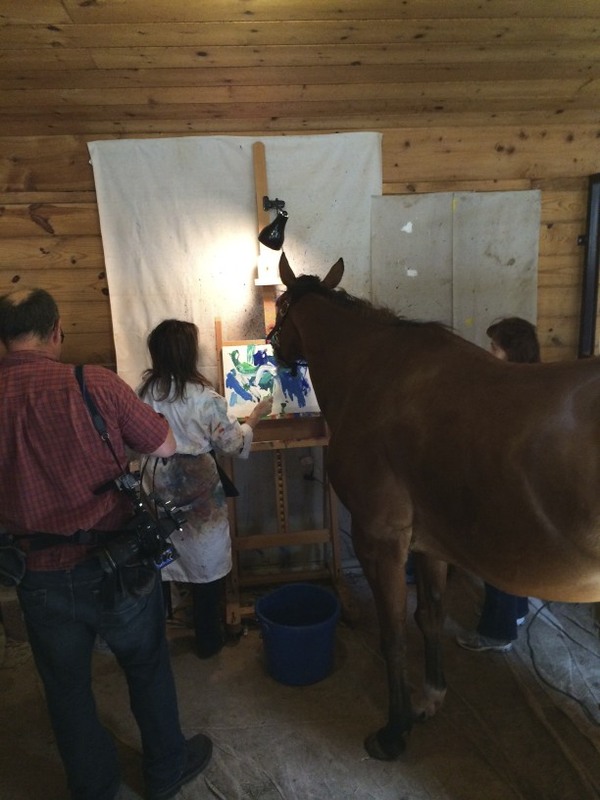 And I painted with Him! 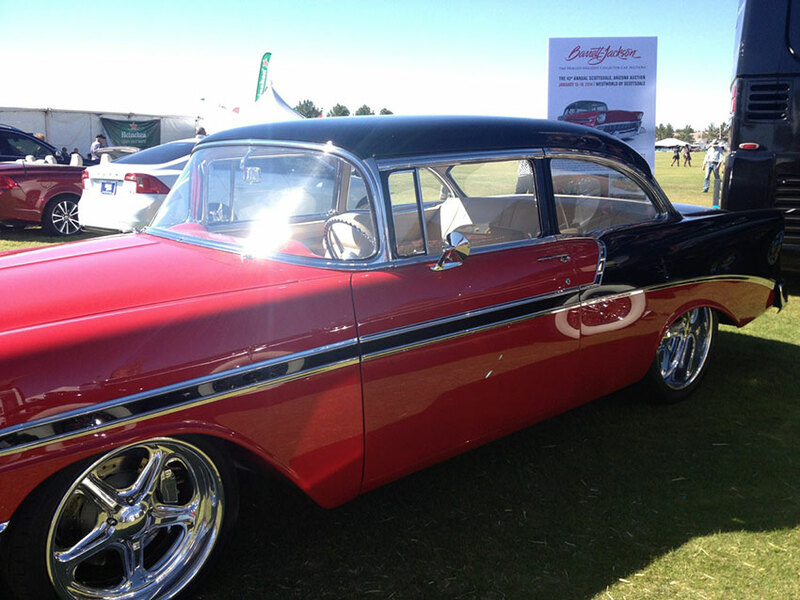 How amazing was this? 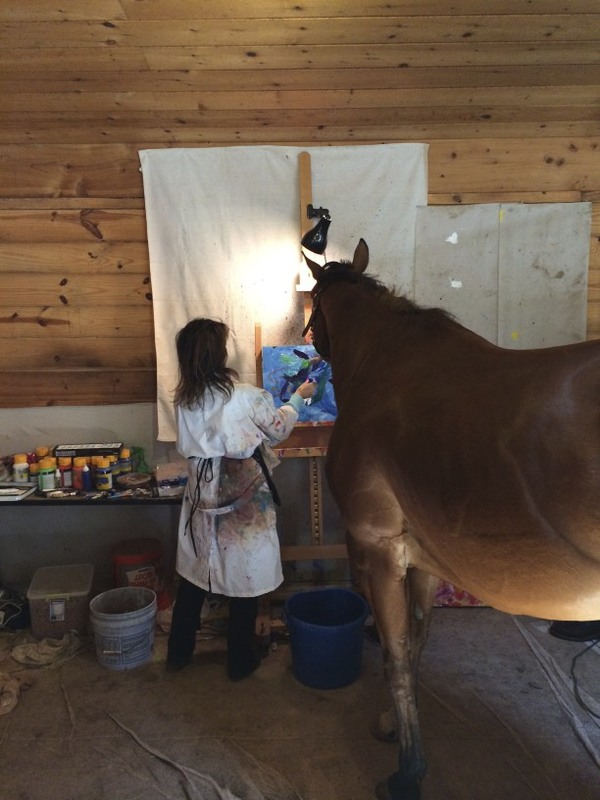 So many artists paint the image of the horse - but how many get to actually paint With a horse??? 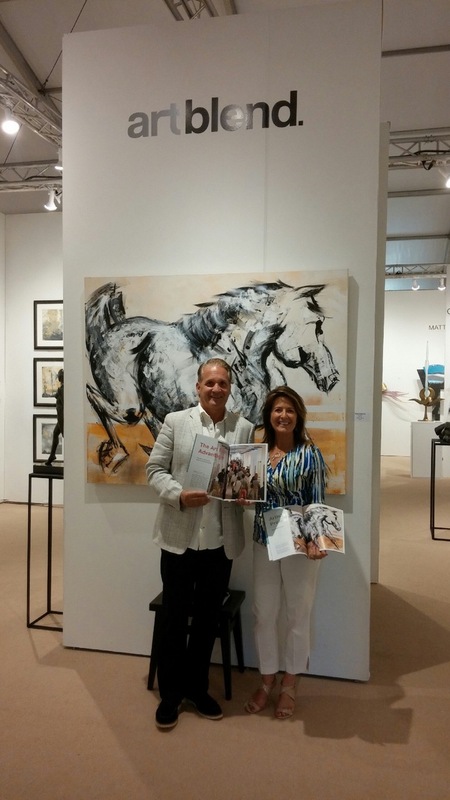 I did - during Belmont week in Rocky Ridge MD where I visited Metro Meteor - an ex-racehorse that used to be a winning sprinter - and is now a winning artist - his work being sold in a local gallery as well as having his images used for pillows, totes, saddle pads, halters, etc. A generous portion of the proceeds goes directly to New Vocations Horse Rescue. 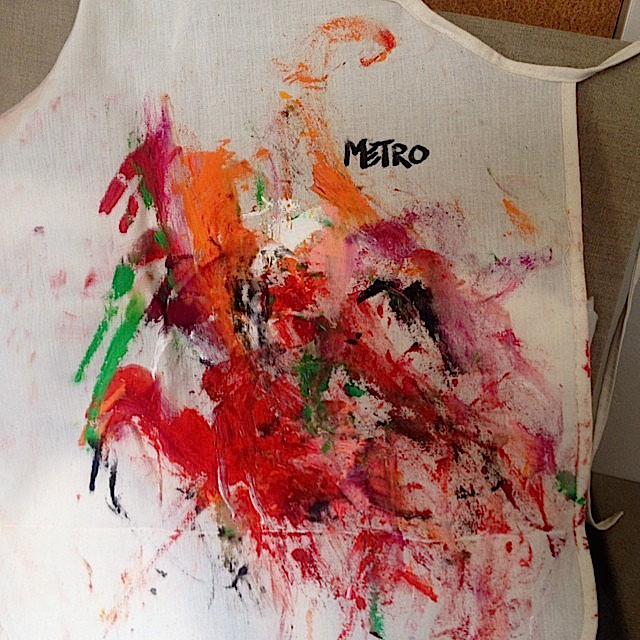 I teamed up with Metro when I saw his work, thinking - I use a lot of my art to support causes I believe in - by donating directly or by Painting Live at events, fundraisers, and Private Client Galas - we need to work together!! 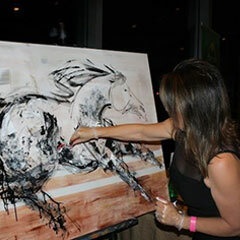 It was one of the most singularly fun and enjoyable experiences I have had - Metro is truly a detailed artist and deeply aware of what he is doing See the video of us working together here on my site on the "Press" page, and google Metro to see where you can buy his art - and our collaborative pieces - as prints and support this work for other horses! Go, Metro, I love you!